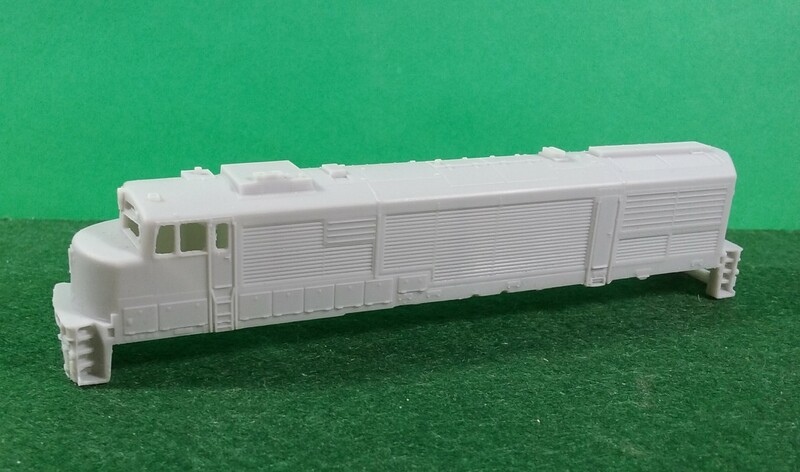 Puttman Locomotive Works is releasing HO Scale EMD/ICG SD20 Locomotive Shell. This unit fits on a Atlas SD24 chassis frame. With some modification, you should be able to use a P2K or Atlas SD7/9 Chassis as well. 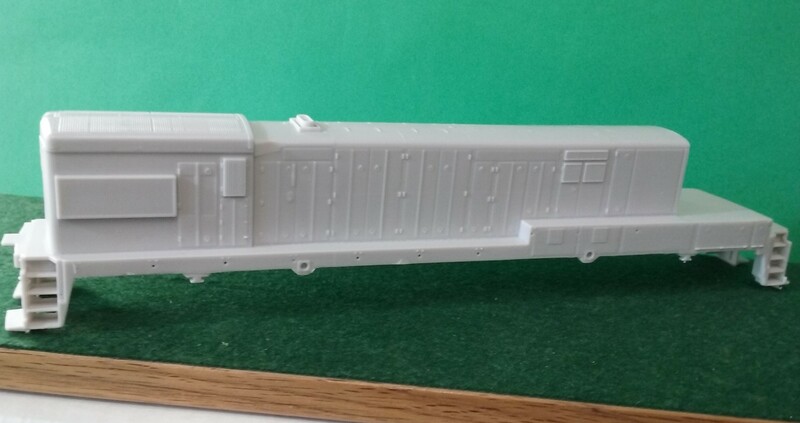 This locomotive shell can be purchased directly through the CMR Products Web site store. 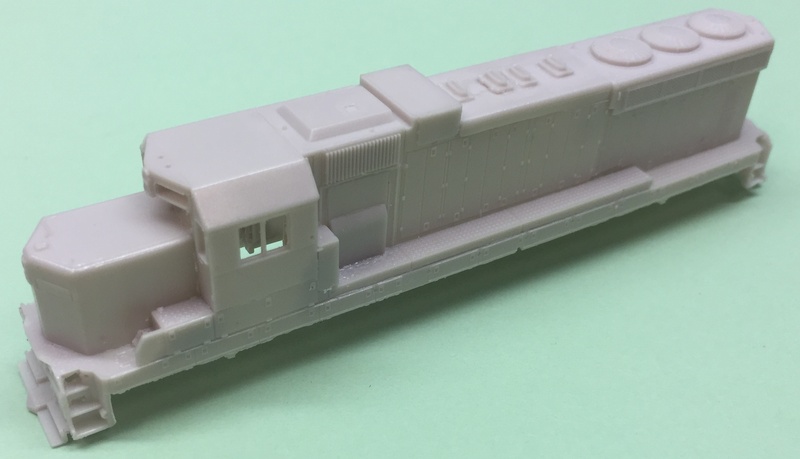 Pacific Northwest Resin is releasing HO Scale CNW E-8 Crandall Cab Locomotive Shell. This shell is designed to use Proto 2000 E-8 chassis. 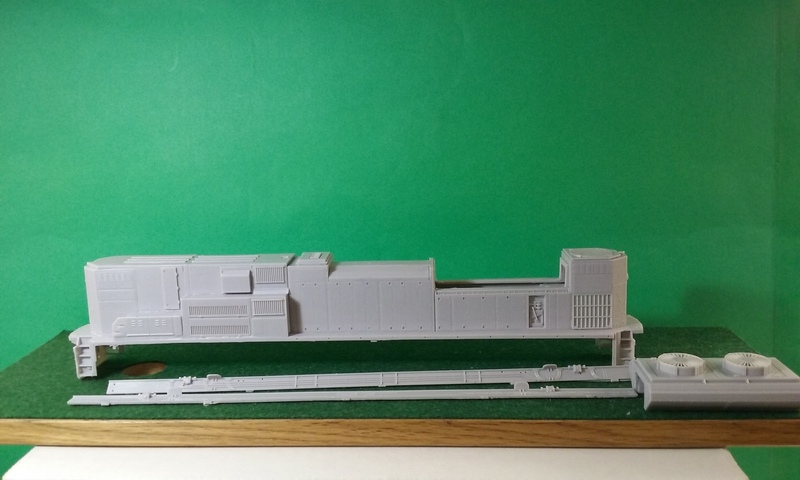 These locomotive shells can be purchased directly through the CMR Products Web site store. 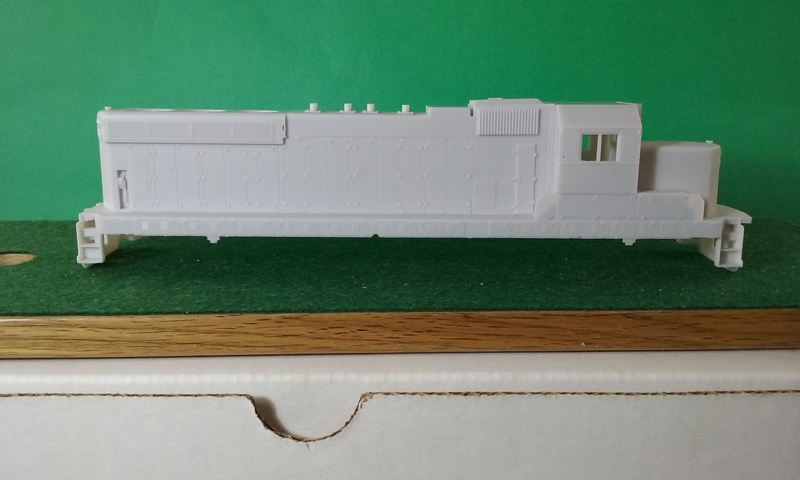 Pacific Northwest Resin is releasing HO Scale CNW EMD GP30 Non Dynamic Locomotive Shell. This shell is designed to use GP30 P2K chassis. 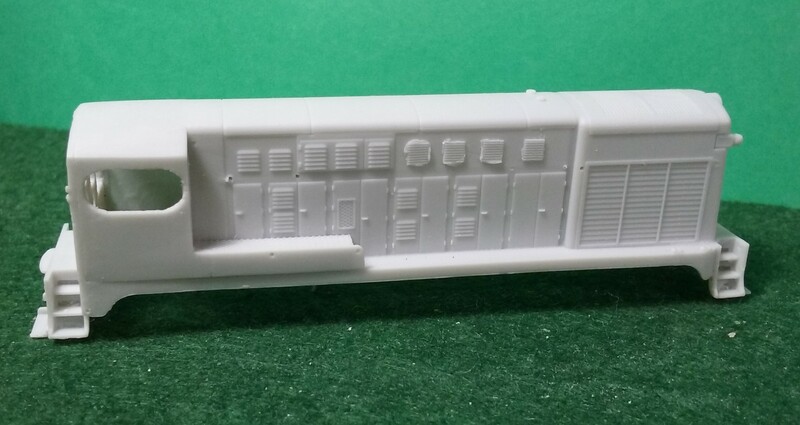 Pacific Northwest Resin is releasing HO Scale GE ATSF, BN U23 C Engine Shell Locomotive Shell. Pacific Northwest Resin is releasing HO Scale EMD Norfolk Southern SD70 ACC Locomotive Shell. 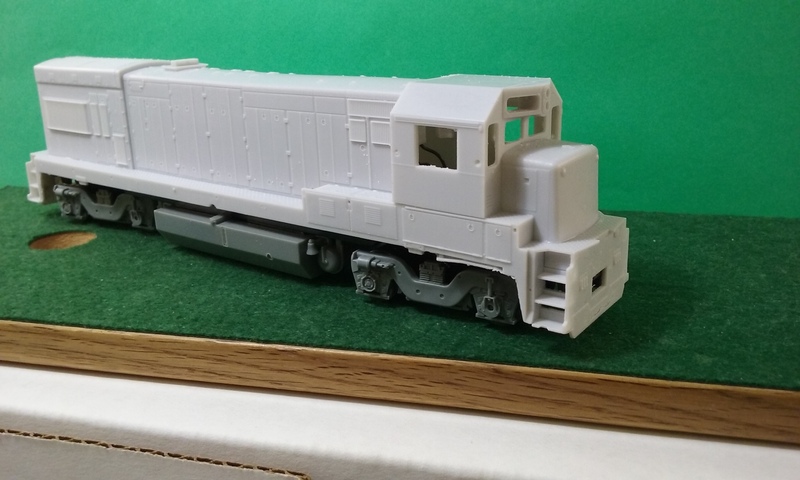 Pacific Northwest Resin is releasing HO Scale SD70ACC Cab Locomotive Part. 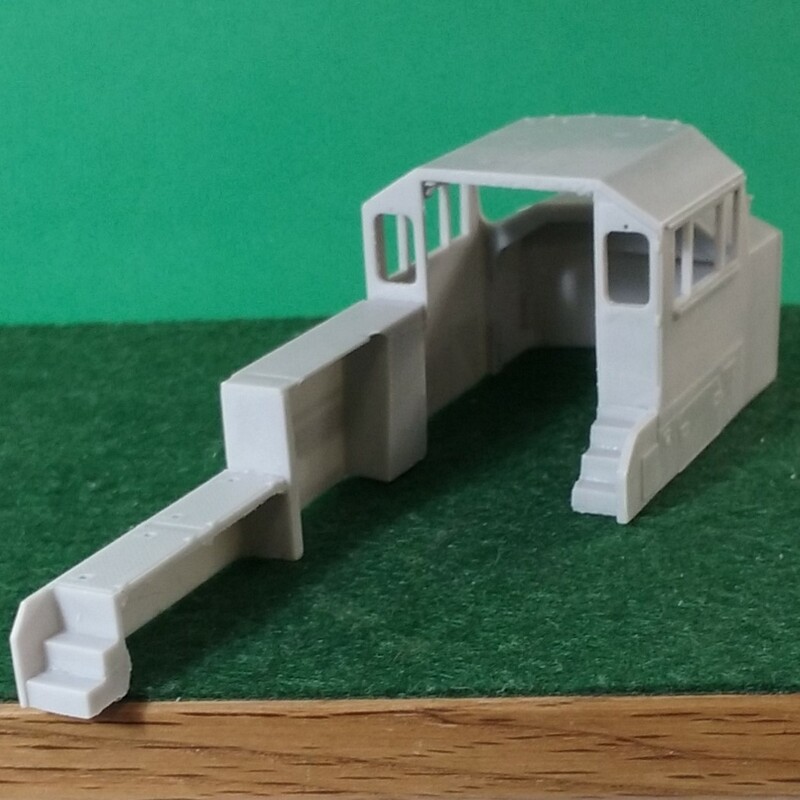 Pacific Northwest Resin is releasing HO Scale EMD RS-1325 Locomotive Shell and Frame. 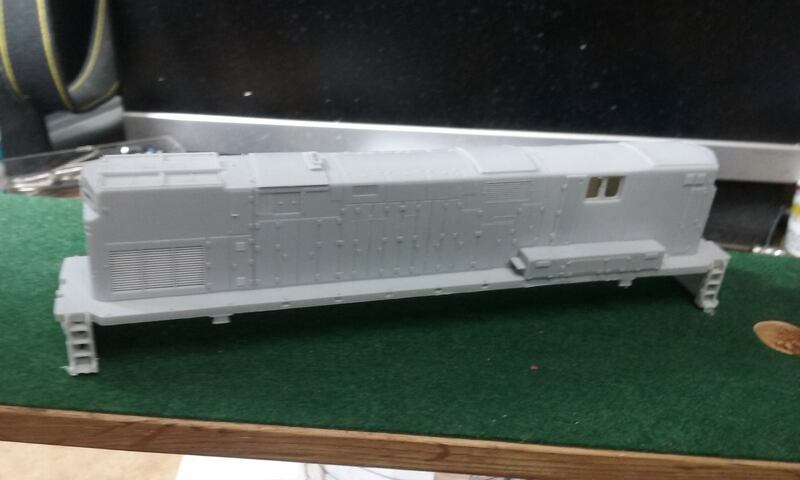 This shell is designed to fit Athearn SD70 ACE chassis frame and with minor mod will fit other brand same chassis. 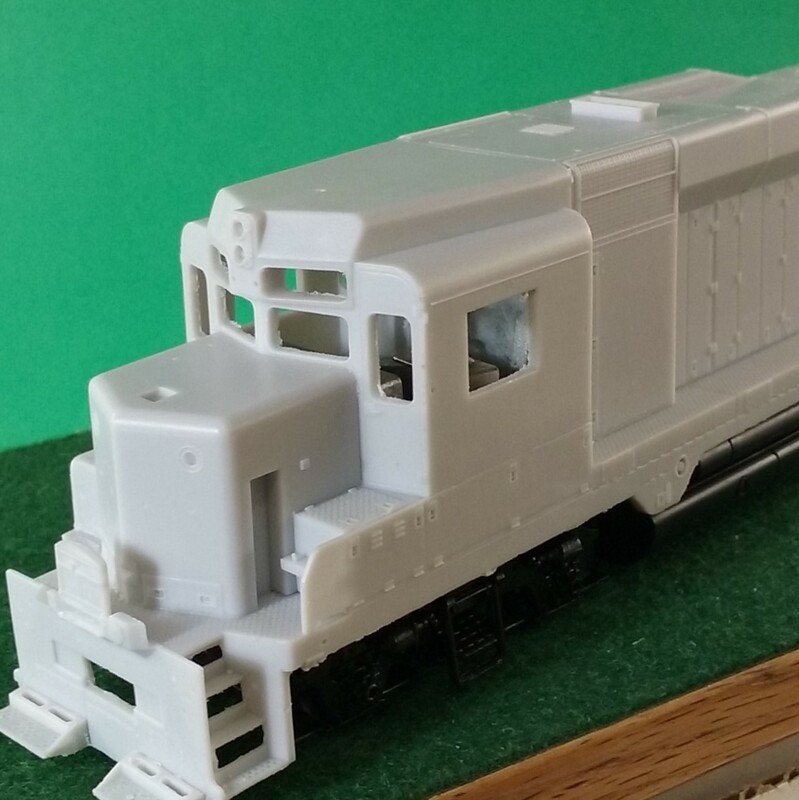 Pacific Northwest Resin is releasing HO Scale MoPac U23B w/ EMD Cab Locomotive Shell. This locomotive shell fits on a Atlas U23B chassis frame. 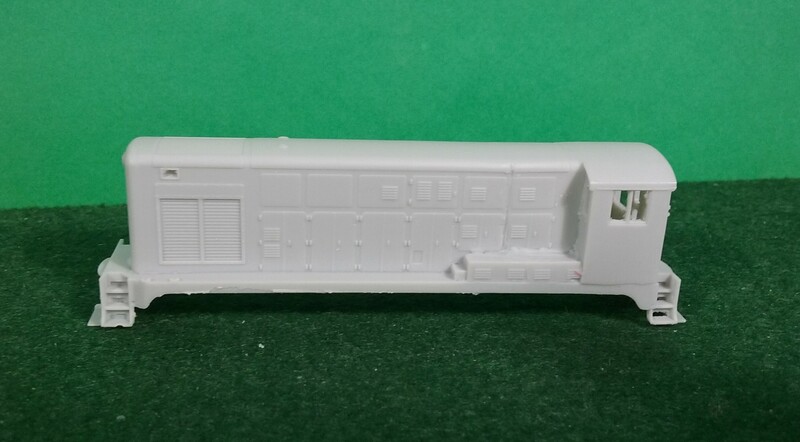 Pacific Northwest Resin is releasing HO Scale SP Tebu Slug Locomotive Shell. 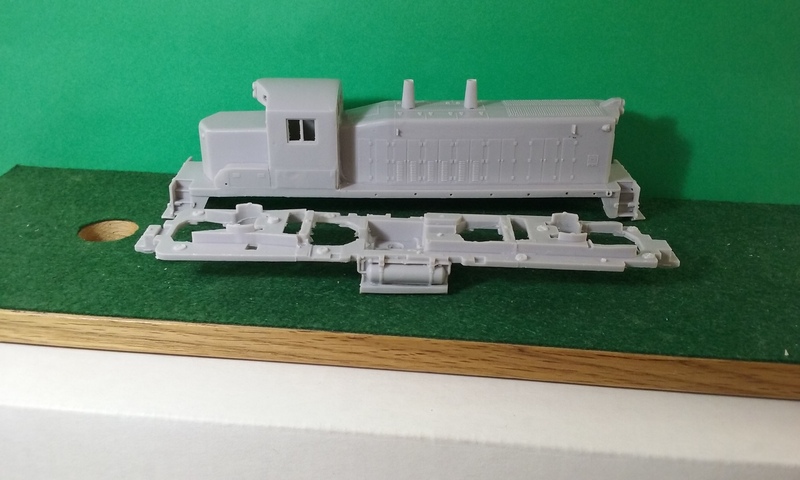 This locomotive shell fits on Bowser U25B chassis frame or with some slight mod to the frame a Atlas U23B chassis frame. This locomotive was rebuilt by MoPac #3318 that was in an front end accident. The cab was removed during this rebuild. 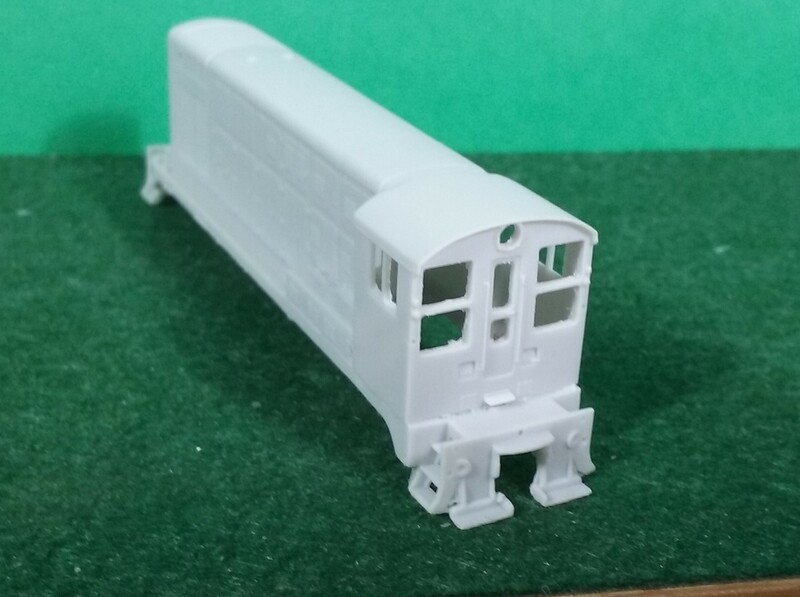 This shell is designed to fit a Athearn U30C blue box chassis frame. 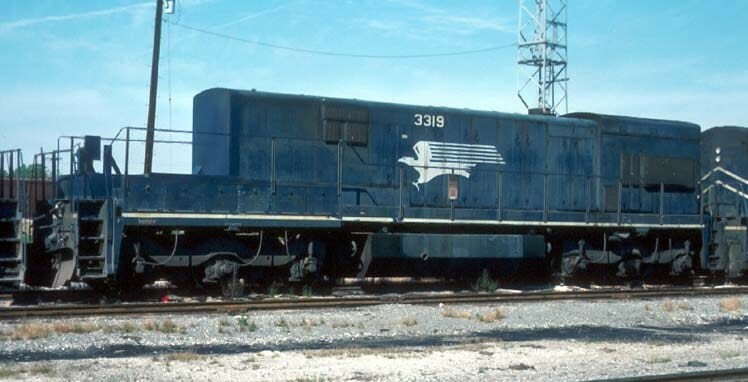 GE built the U30CG for ATSF as a passenger variant of the U30C Locomotive. An initial 6 locomotives were assigned to passenger service, later transitioned to freight service. This unit fits on a Atlas C30 / U30 chassis frame. To get it to fit lower or up into the shell more you may have to modify the frame on the 4 corners to fit up further in the shell. The 4 ladders are thin and may break they can be replaced with brass after market ladders by cal scale. Conrail built these unique slugs from former Penn Central RS-11 Locomotives. These slugs saw service with NS, CSX and several shortlines. This shell fits the Atlas RS-11 chassis. Purchased from GE just after the C30-7 locomotive was discontinued, the C30-7a is a 12 cylinder version of the C36-7 locomotive. 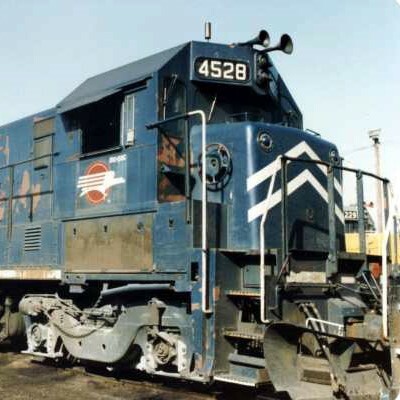 Conrail was the only owner of the C30-7a owning a total of 50 (CR 6550-6599). This shell fits the Atlas C30-7 chassis. This modernized E-8A was used by Amtrak, Burlington Northern, Chicago North western and Conrail Executive Service. This shell fits a Kato E-8a. 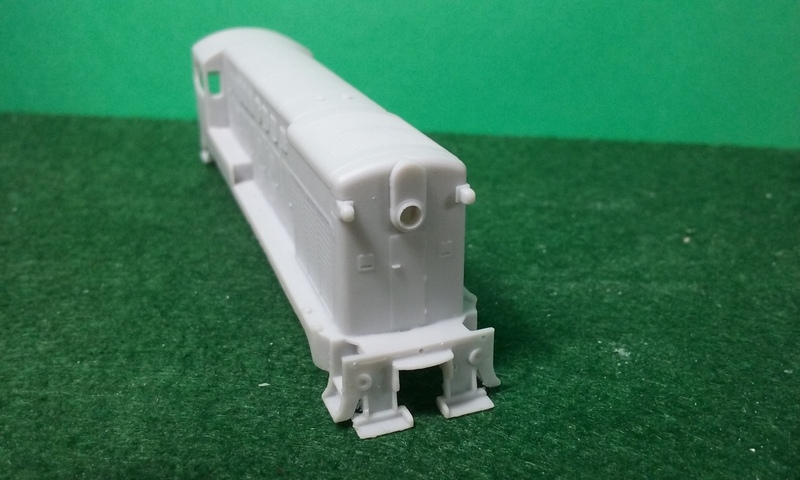 These locomotive shells can be purchased directly through the CMR Products Web site store. Window Glass is also available for this shell. Puttman Locomotive Works is releasing N Scale Fairbanks Morse H-12-44 Yard Switcher. The FM H-12-44, released in 1950, was FM’s second Yard Switcher offering. It closely resembled their other switcher (H-10-44). 303 of these models were built. Major Owners of this locomotive include ATSF, Canadian National, Milwaukee Road, NYC, Southern Pacific. 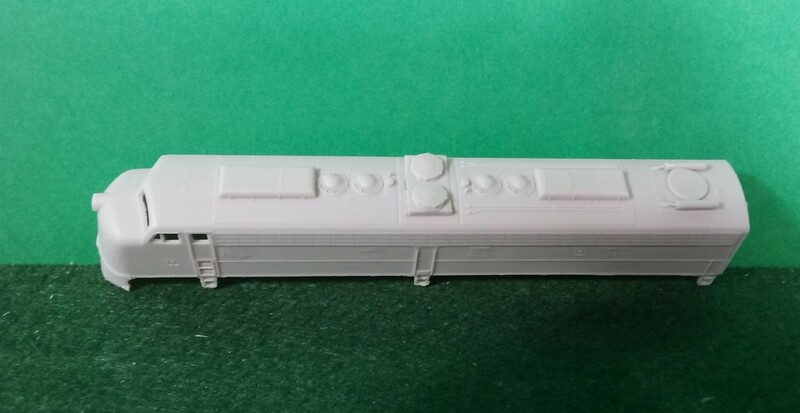 Puttman Locomotive Works is releasing HO Scale Baldwin DR 6-4-2000 Double Ended Baby Face Locomotive Shell. 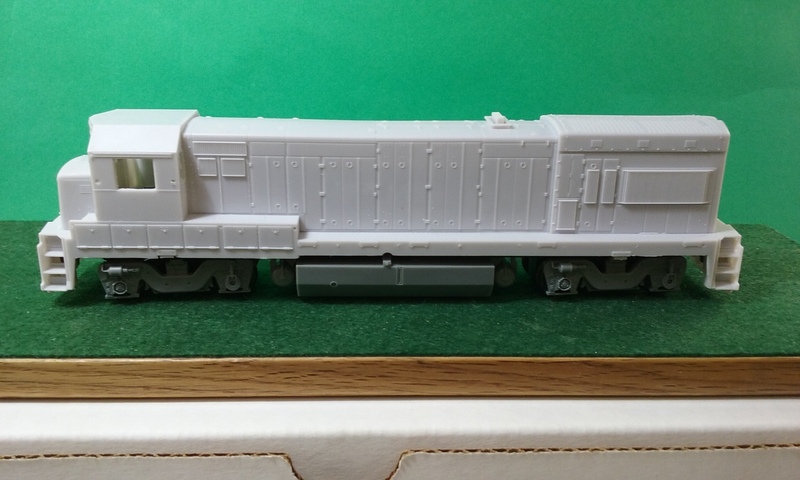 Recommend using Part Number HO187 DR 6-4-2000 Double Ended Frame. Using this frame and a Proto 2000 DL109 donor chassis for all chassis parts and motor. They just snap right in. 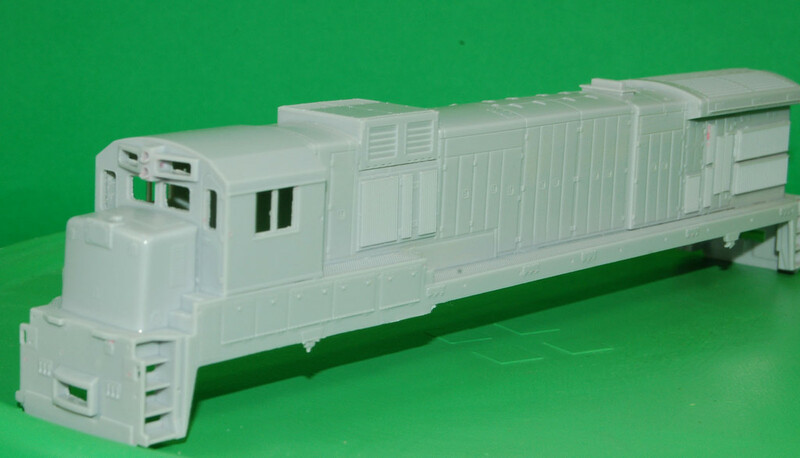 Puttman Locomotive Works is releasing HO Scale EMD Rebuild DRS 6-6-1500m “Buffalo” Chop Nose Locomotive Shell. 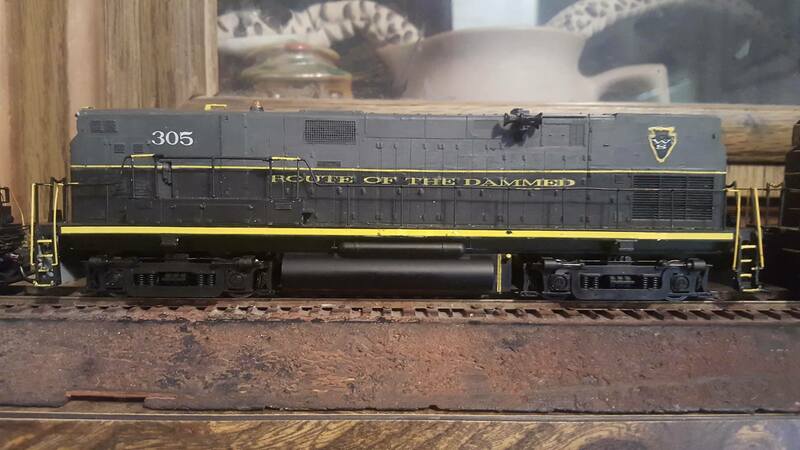 The HO Scale EMD Rebuild DRS 6-6-1500m “Buffalo” Chop Nose. Will work for the 4 axle AS16M as well. The DRS 6-6-1500M Chop Nose was owned by Union Railroad. This locomotive shell will fit on the Bowser AS16 for the 4 axle version, and AS616 for the 6 axle version. Puttman Locomotive Works is releasing N Scale Fairbanks Morse H-20-44 Road Switcher. The FM H-20-44, released in 1947, was FM’s first Road Switcher offering. It closely resembled their other switchers (H-10-44 and H-12-44). 96 of these models were built. Original Owners include ACY, NYC, PRR, P&WV and UP. 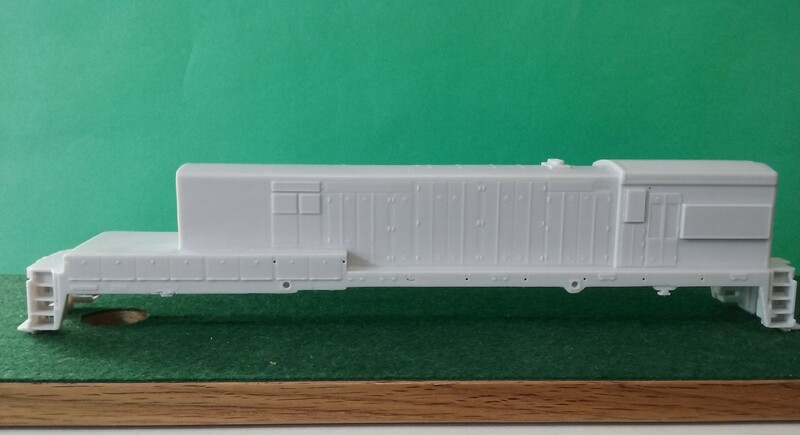 Puttman Locomotive Works is releasing HO Scale Alco S-6 Locomotive Shell. 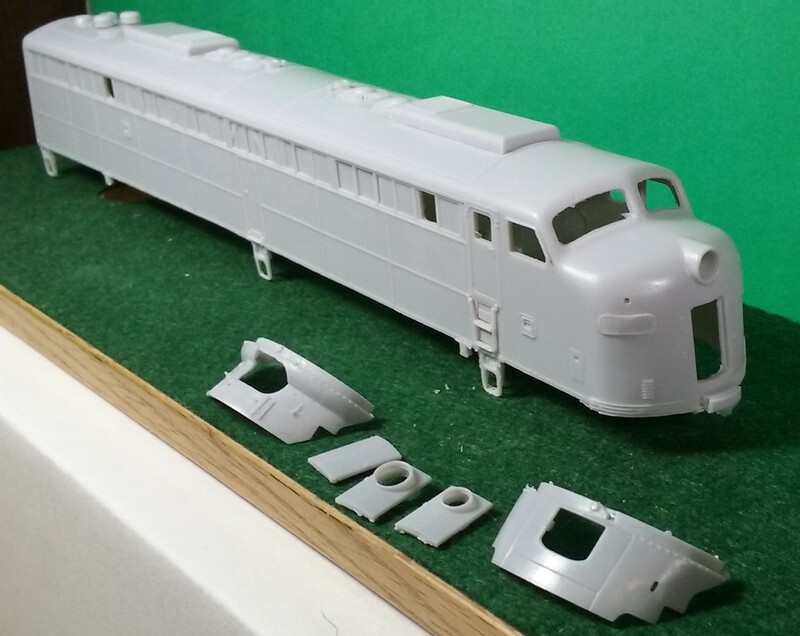 This locomotive shell is designed for the Proto S2 chassis. 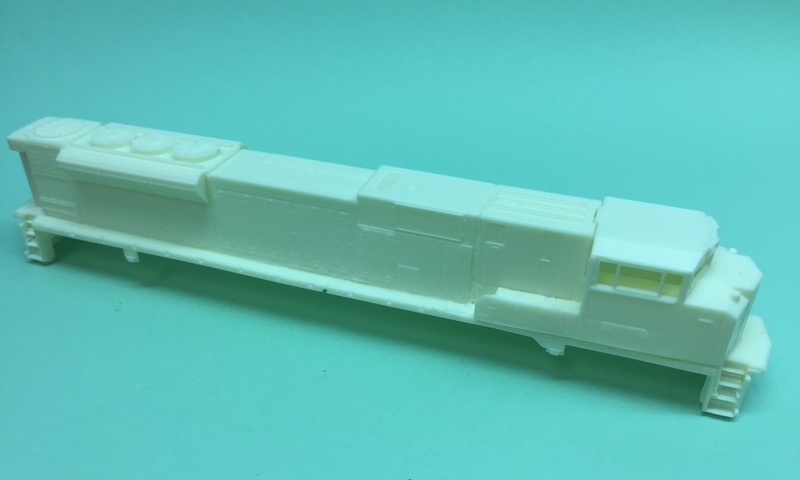 Puttman Locomotive Works is releasing HO Scale Conrail E-8 A Unit Engine Shell with Parts. 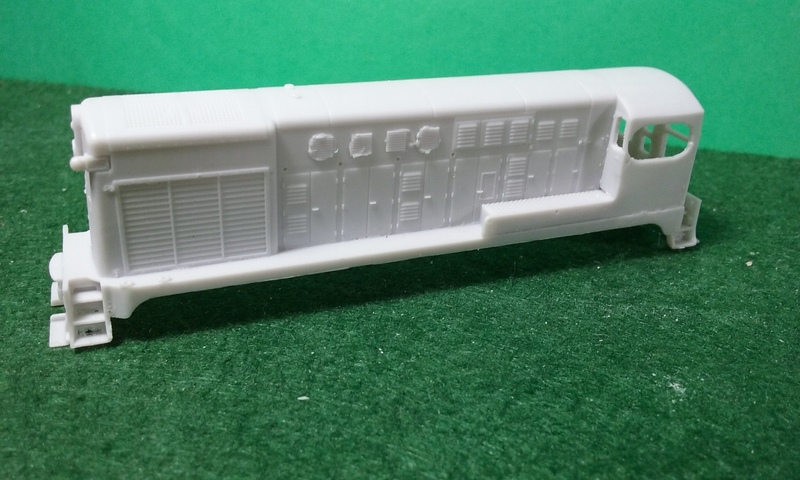 This locomotive shell will fit BLI, Proto 2000, or any other HO scale E-8 chassis with some minor modifications or added clips or another type of E unit. Puttman Locomotive Works is releasing HO Scale Fairbanks Morse H-20-44 Locomotive Shell with parts. This locomotive shell is designed for the Walthers H-10-44. Additional parts are included with the shell including fan and fan screen. Puttman Car Works is releasing HO Scale – Bessemer & Lake Erie 52′ 6″ Waffle Side Gondola. 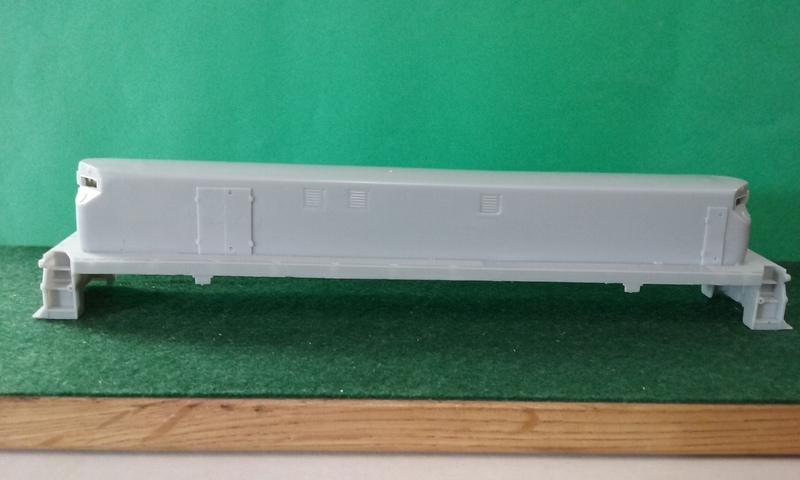 This is an undecorated HO Scale Polyurethane B&LE 52’6″ Waffle Side Gondola. Details as shown are included. This kit does not include trucks or couplers. 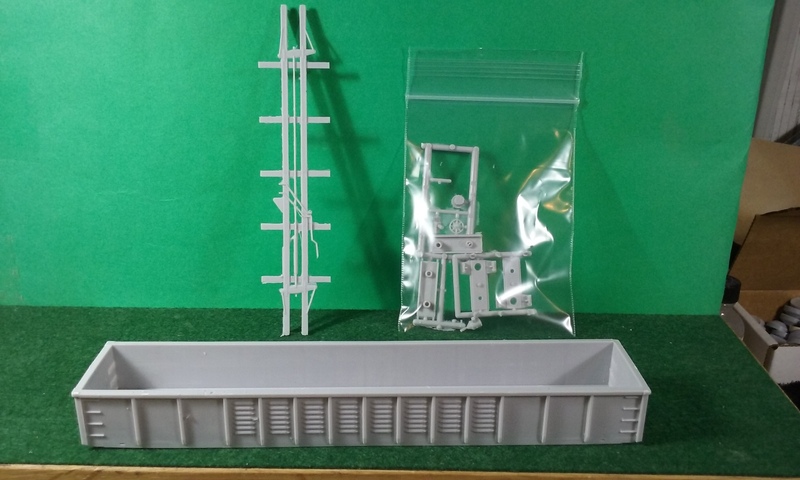 This freight car kit can be purchased directly through the CMR Products Web site store. 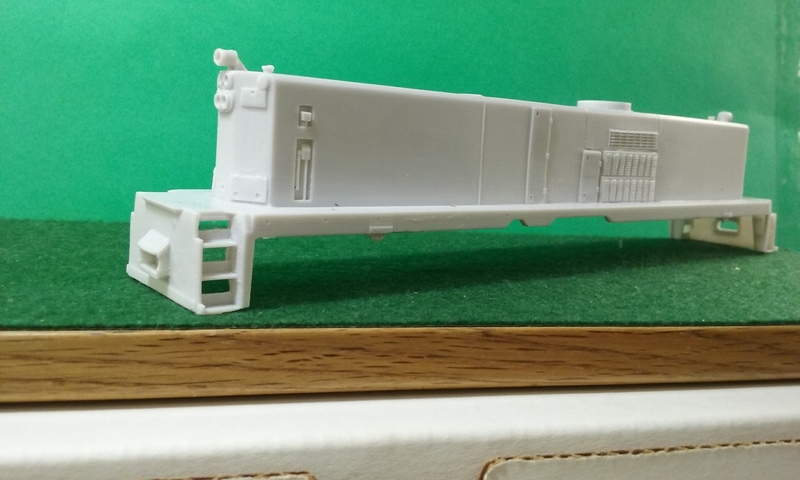 Puttman Locomotive Works is releasing HO Scale BNSF AC44C4M Locomotive Shell. 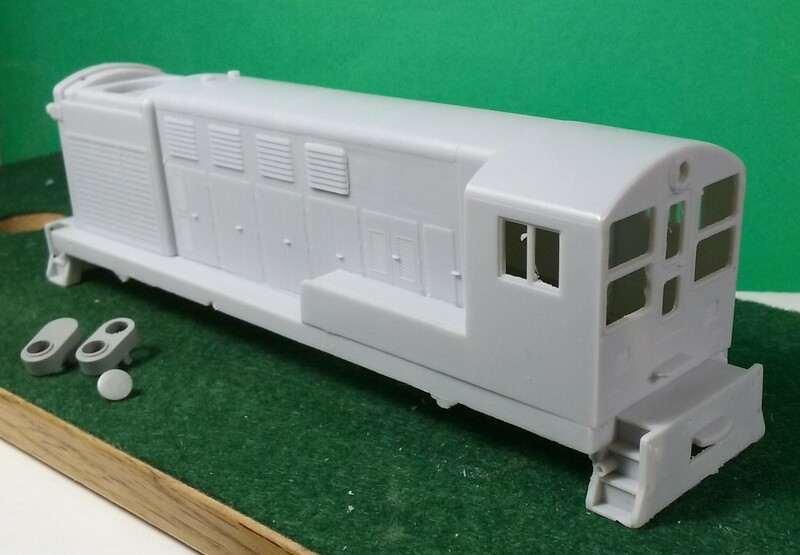 This locomotive shell will work with Kato Ac4400 Chassis. 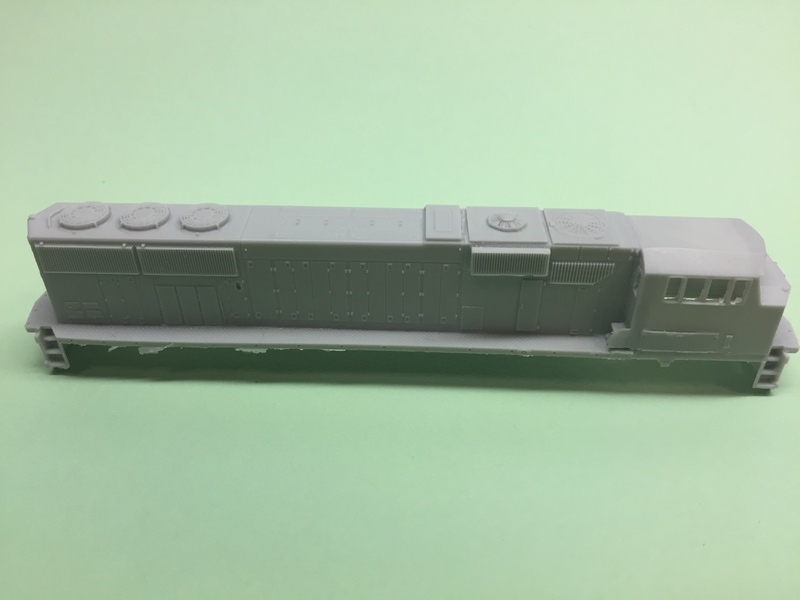 Puttman Locomotive Works is releasing HO Scale MK SD50M-3 Locomotive Shell. 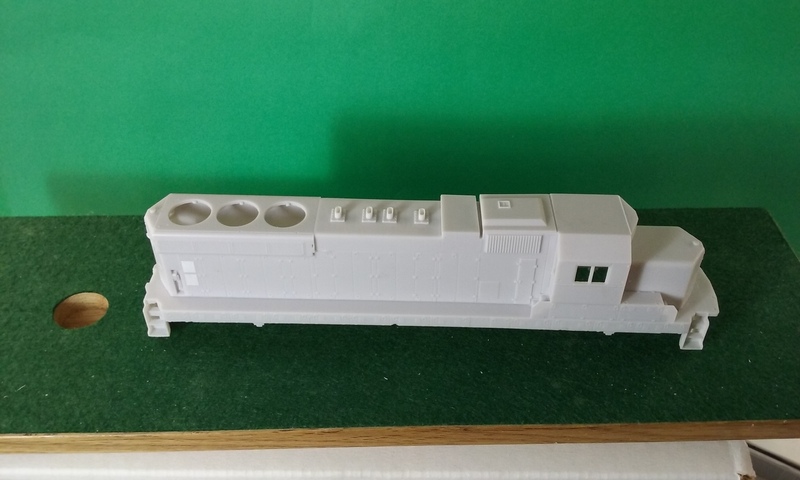 This locomotive shell will fit a Kato SD45 Chassis. 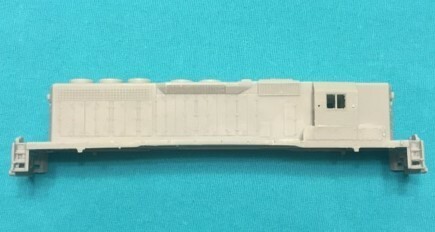 Puttman Locomotive Works is releasing HO Scale SD45X Long Hood Part. 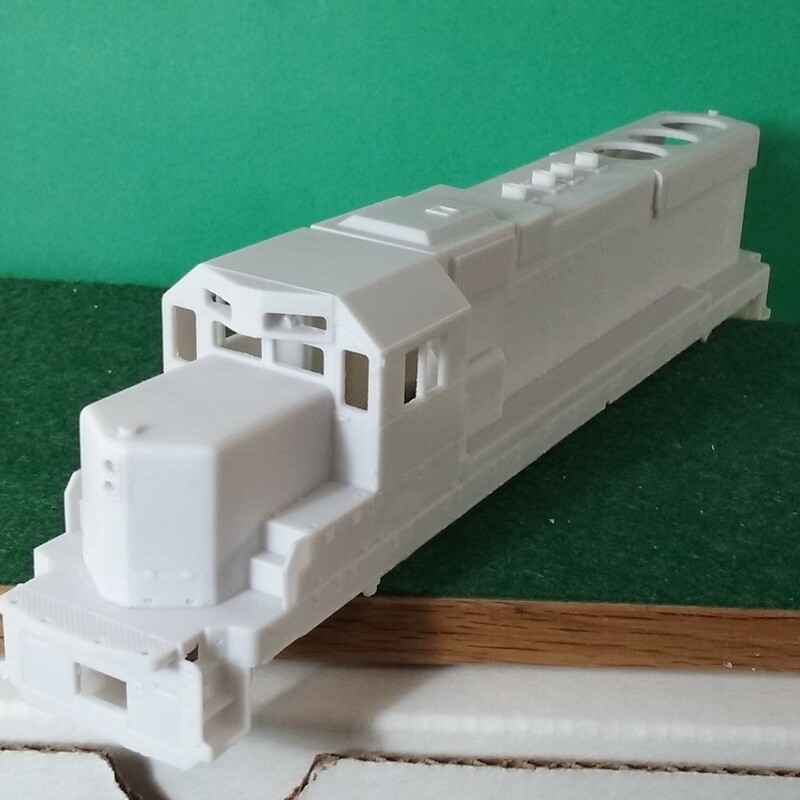 This locomotive shell part will fit on an Athearn RTR SD45T-2. This locomotive shell Part can be purchased directly through the CMR Products Web site store. 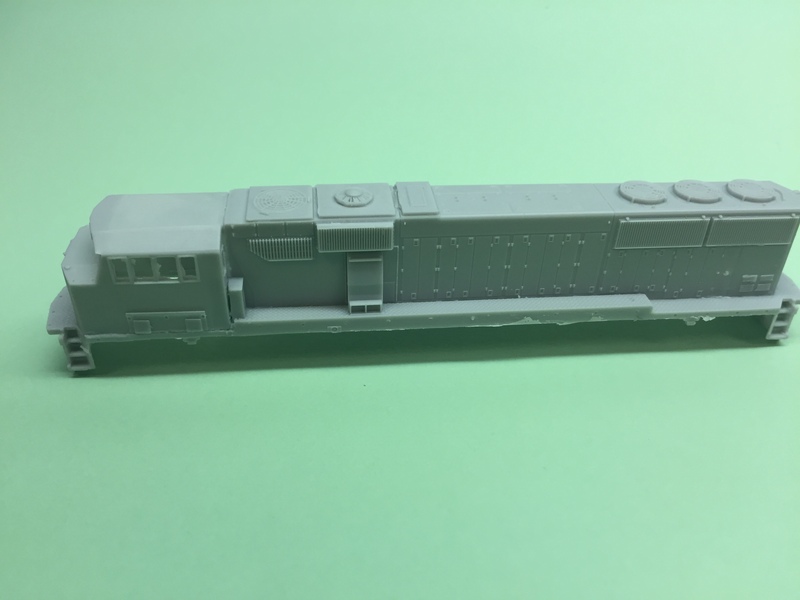 Puttman Locomotive Works is releasing N Scale GE U30CG Locomotive Shell. ATSF originally purchased 6 of these unique locomotives for Passenger service. After an accident, where the GE model designed was blamed, these locomotives were reassigned to freight duties. 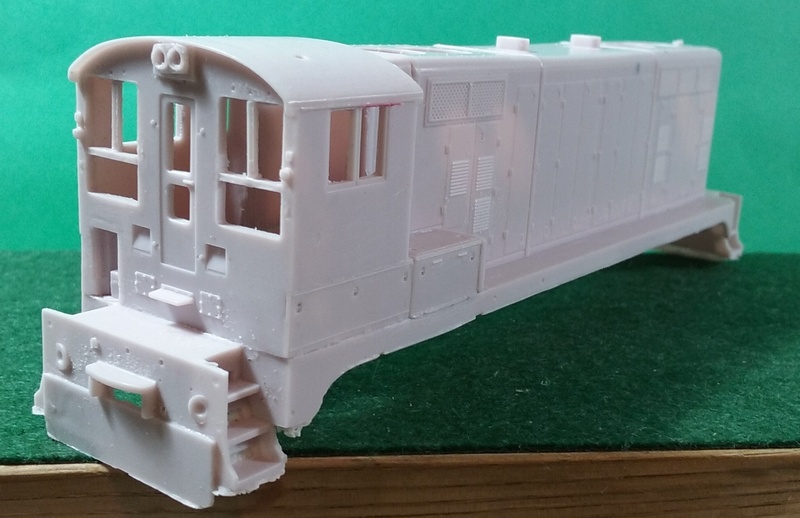 Puttman Locomotive Works is releasing N Scale Delaware Hudson RS3u Cab and Long hood. Morrison-Knudsen rebuilt 8 Delaware Hudson RS3’s with ALCO 12-251C prime movers boosting it them to 2000hp. The locomotive master was designed and built by Shultz’s Mod Shop and Custom Creations. Puttman Locomotive Works is releasing 3 Versions of Norfolk Southern’s GP38-2 dynamic brake sections used in their various GP38/GP38AC Rebuilds. The Detail part is available in 3 variations, Dynamic Brake Square Filter, Dynamic Brake Ext Range Squared Filter, Dynamic Brake Ext Range Angled Filter (front to back). This detail parts can be purchased directly through the CMR Products Web site store. 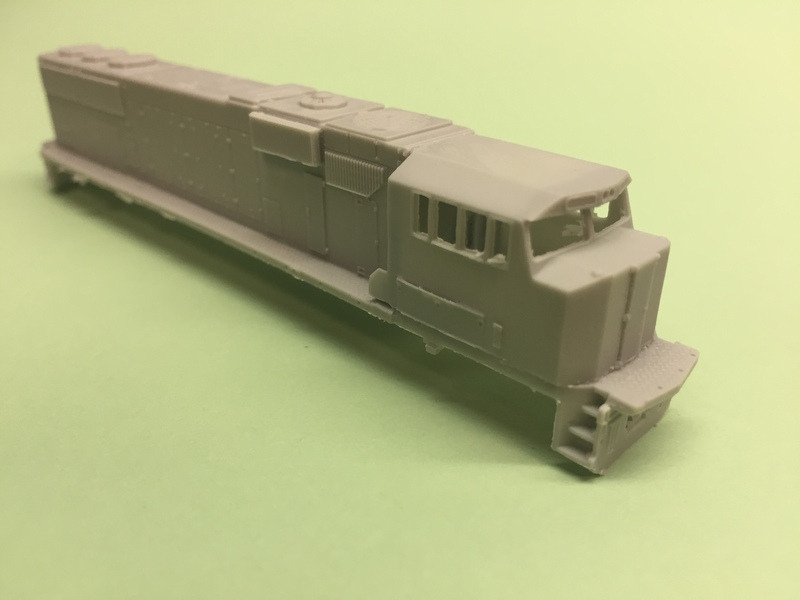 Puttman Locomotive Works is releasing HO Scale EMD SD18 Chop nose without Dynamics Locomotive Shell. This locomotive shell will fit on an Atlas SD24/26 chassis. Fans, Cab Glass and what ever details you would like to add do not come with this product. 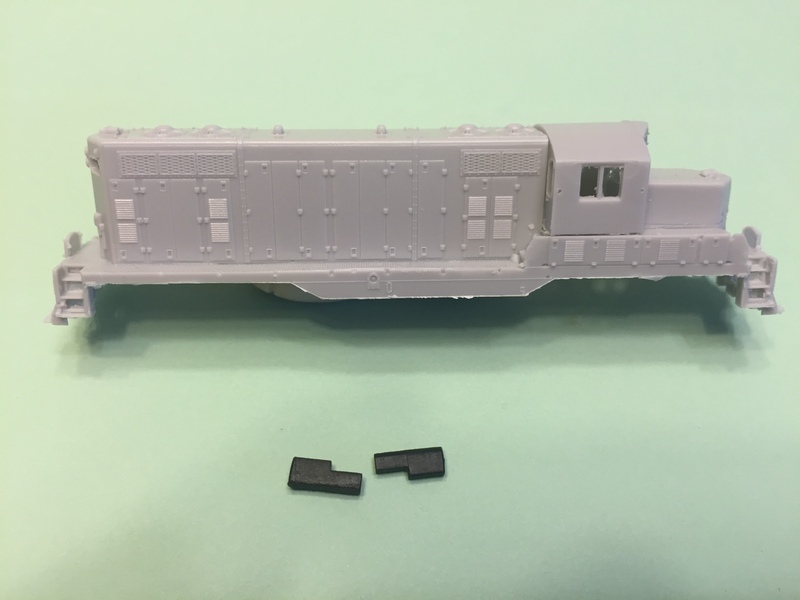 Puttman Locomotive Works is releasing HO Scale EMD SD18 Chop nose with Dynamics Locomotive Shell. 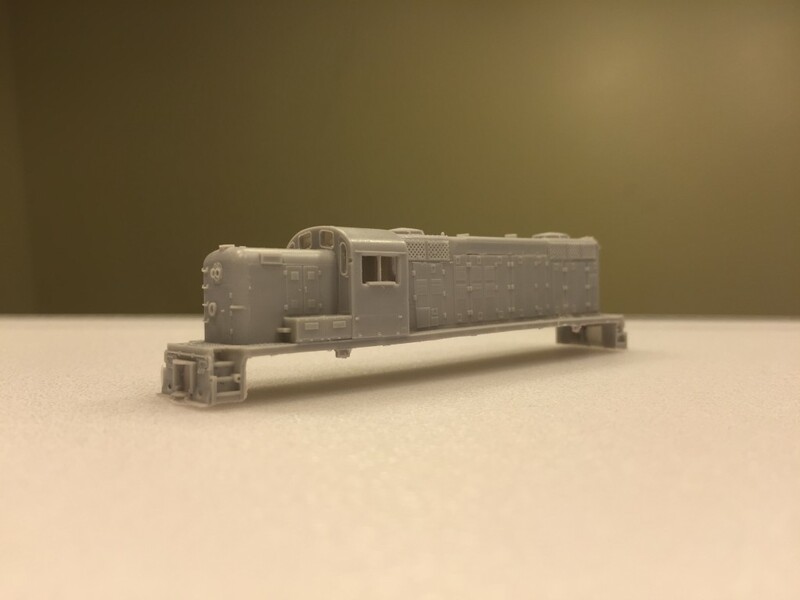 Puttman Locomotive Works is releasing HO Scale Union Pacific SW10 Rebuild Shell. 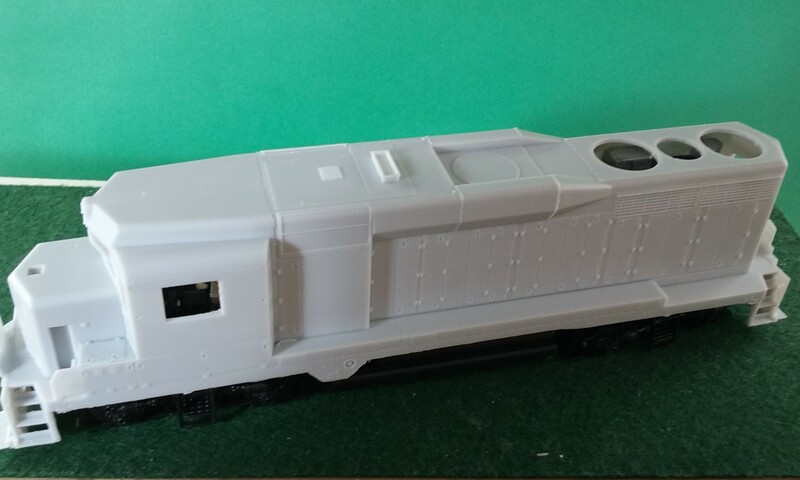 This polyurethane locomotive shell will sit directly on Broadway Limited Imports SW7, Kato NW2 and Life Like Proto 2000 SW8-9 Sill/chassis without modifications. Shell comes with two (2) cast fans. 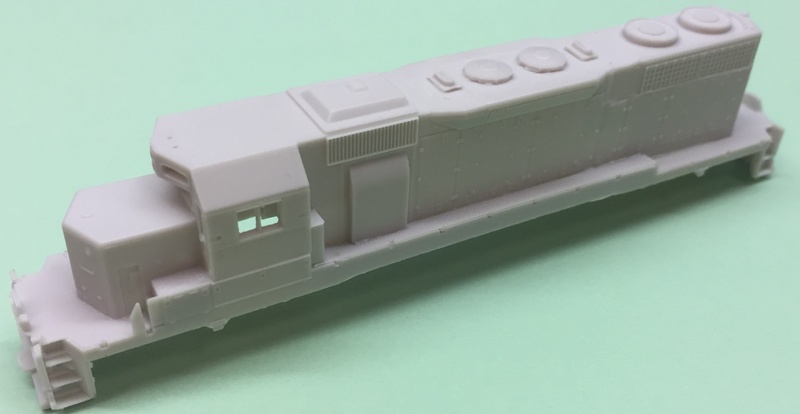 Puttman Locomotive Works is releasing HO Scale – Alco T-6 Locomotive Shell. The Alco T-6 was a 1000hp Locomotive produced from 1958 to 1969. The “T” stood for Transfer, as the locomotive was built to be more of a road locomotive than their “S” counterparts. Several railroads purchased the T-6 new, including Norfolk Western (40), PRR (6), and a number of shortlines/industrials. These locomotives were subsequently sold to a number of other railroads and still are found running today. This locomotive shell will fit on a Proto 2000 S-3 chassis. 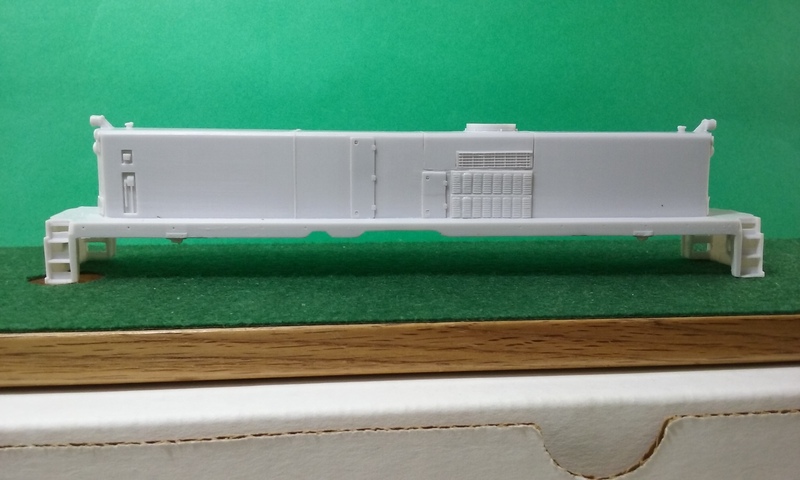 Puttman Locomotive Works is releasing HO Scale ATSF SWBLW “Beep” Locomotive Shell. This locomotive shell will fit on a Bowser VO1000. 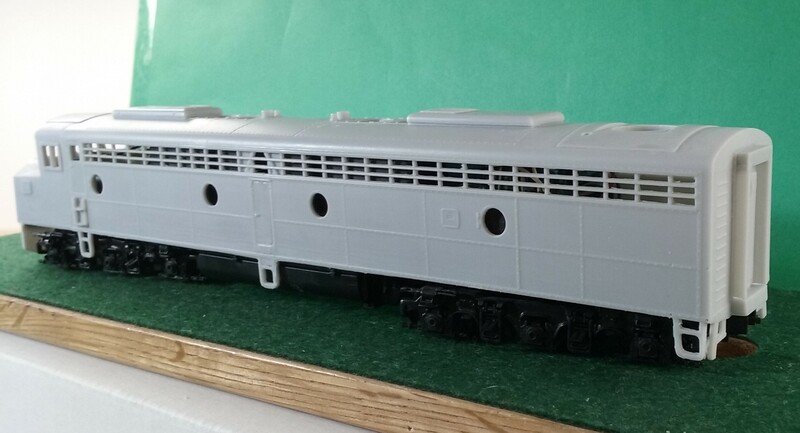 Puttman Locomotive Works is releasing HO Scale EMD Rebuild DRS 6-6-1500m “Buffalo” High Hood / AS16M High Hood. 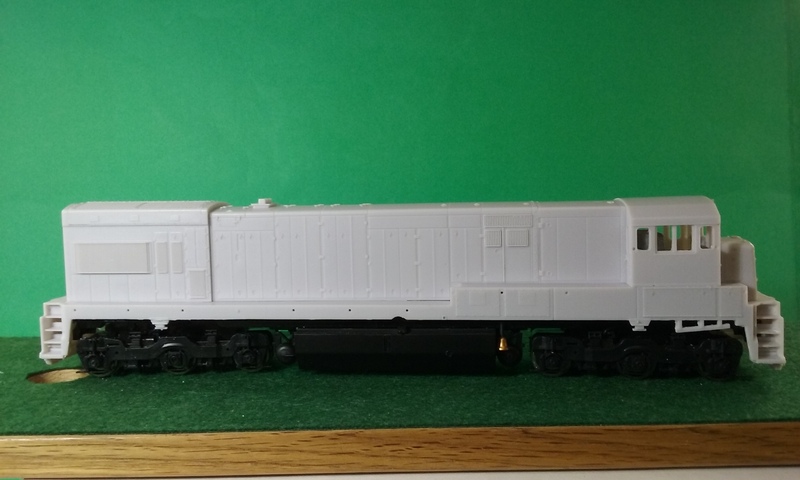 The HO Scale EMD Rebuild DRS 6-6-1500m “Buffalo” High Hood. Will work for the 4 axle AS16M as well. The DRS 6-6-1500M High Hood was owned by CNW and briefly by Union Railroad. Union later chopped the short hood for better visibility. AS16M was owned by Norfolk Western and CNW. 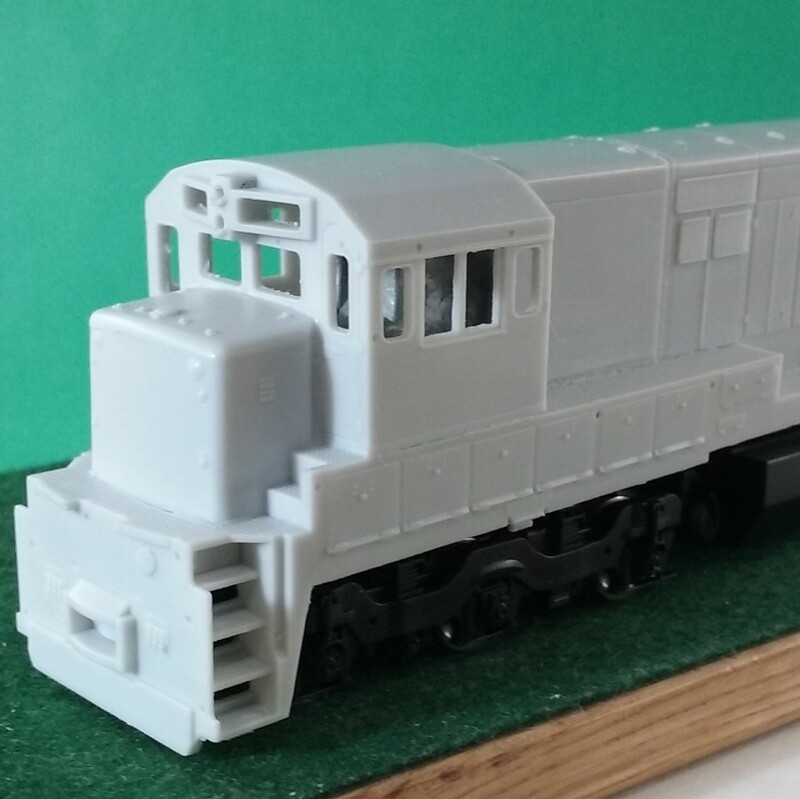 Puttman Locomotive Works is releasing N Scale SD38 with Dynamic Brakes Locomotive Shell. EMD Built 63 SD38’s for North American use. Of those only 12 were built with Dynamic Breaks (BLE 3, EJE 6, MCR 3). 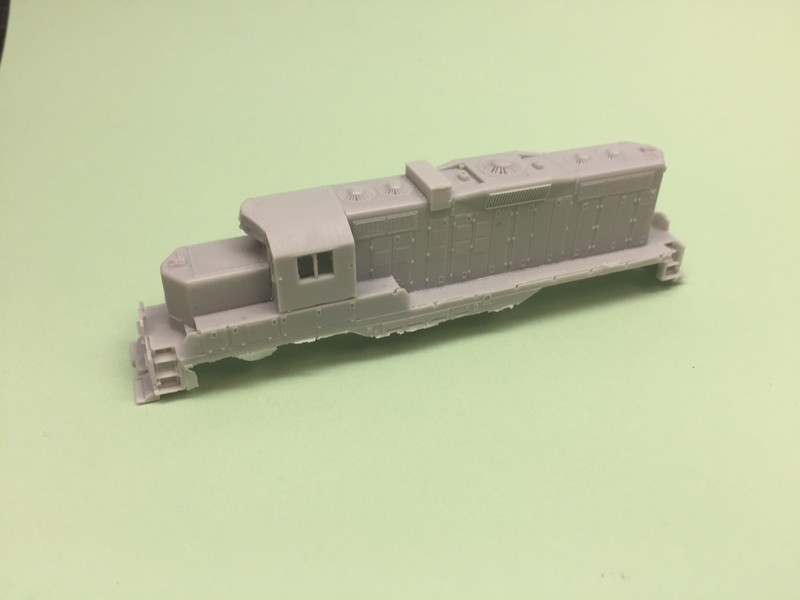 Puttman Locomotive Works is releasing N Scale SD38AC Locomotive Shell. 15 SD38ACs were built by EMD. 6 were purchased by BLE and 8 by DMIR. EMD built 47 locomotives for North American use. Of those, only B&LE and C&O Purchases were Low Nose models with dynamic brakes. These locomotives saw secondary service on other railroads including leasing companies, EJ&E, IAIS and others. ICG rebuilt 42 locomotives to the SD20 from former SD7s, SD24s, SD24Bs and SD35s. They operated on ICG and IC and many other shortlines afterward. 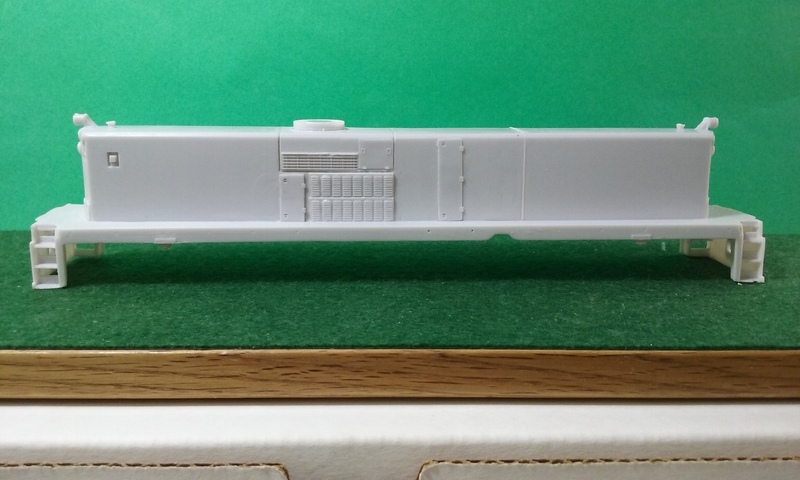 Puttman Locomotive Works is releasing HO Scale C420 B Unit Locomotive Engine Shell. This locomotive shell will fit on an Atlas C420. Its modeled after the M420 B Unit, but with the US based C420. 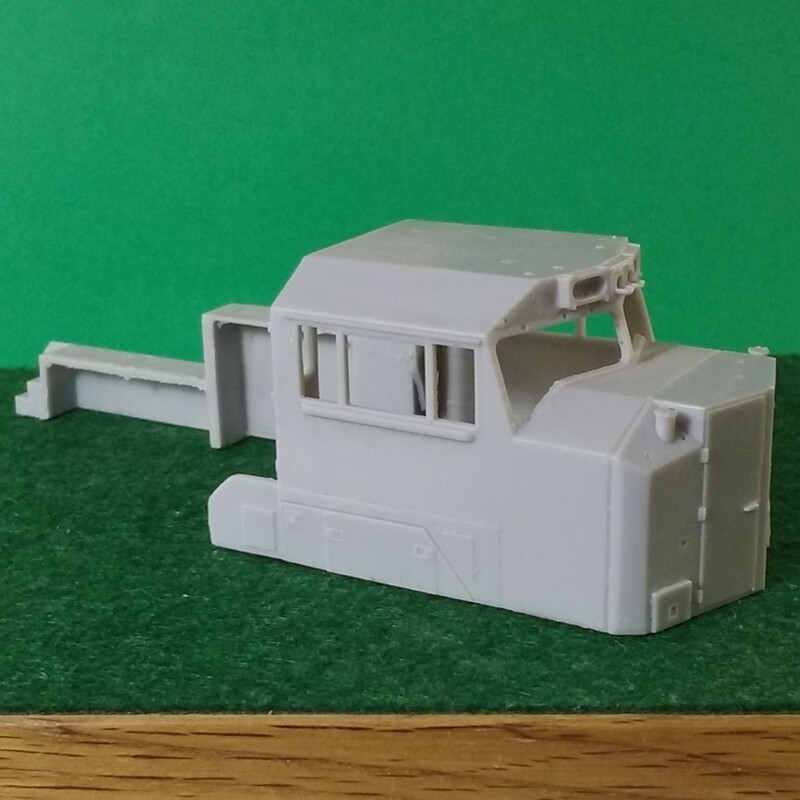 Puttman Locomotive Works is releasing HO Scale RS3 Chop Nose Cab Section. This Locomotive Part is the same Chop Nose section that was used on our Delaware Hudson RS3U Locomotive Shell. 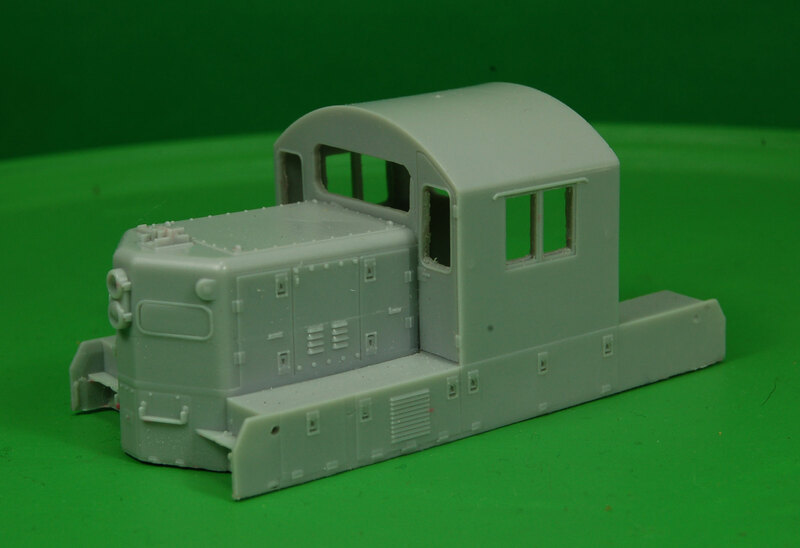 Puttman Locomotive Works is releasing Alco RS11 Chop Nose Locomotive Shell – HO Scale. 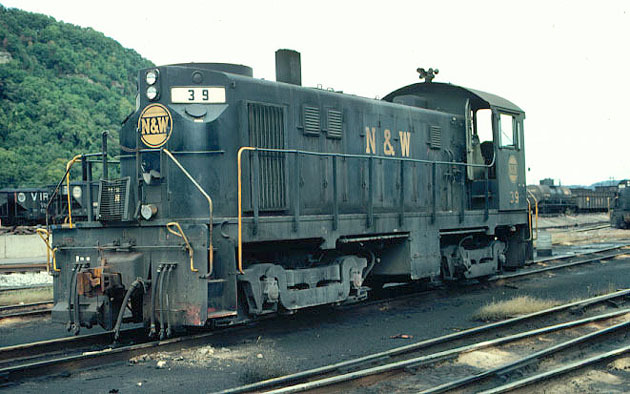 The chop nose RS11 was completed both by Alco (Factory Option) and by local railroad shops. 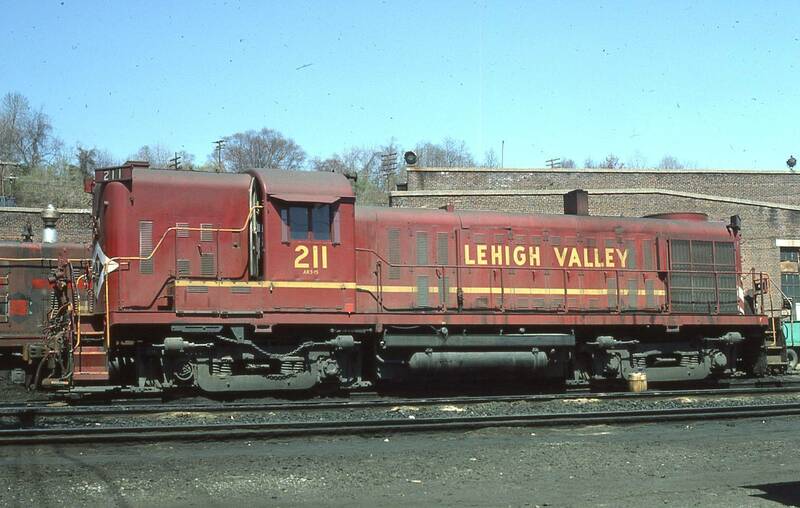 This variant is representative of Delaware Hudson and Lehigh Valley models among others. 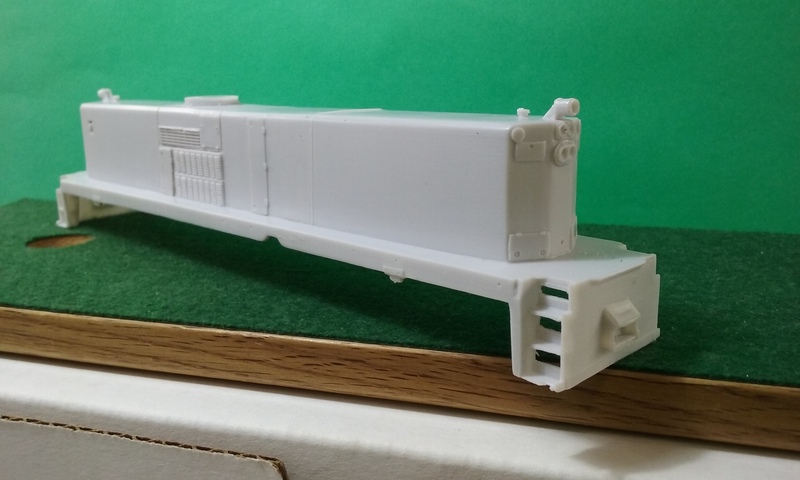 Innovative Modeling Products is releasing N Scale 36″ EMD Domed Intake Fans Detail Part. The 36″ domed EMD fan was commonly seen on E and F Units along with early generation GP’s and SD’s, along with several rebuilds of other locomotives with EMD engines. This locomotive detail part can be purchased directly through the CMR Products Web site store. 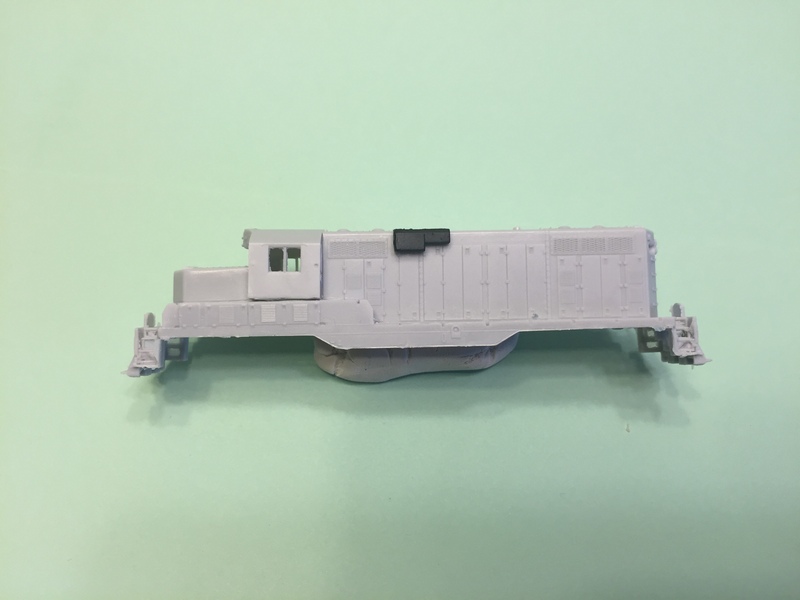 Puttman Locomotive Works is releasing N Scale RS3 Winterization Hatch Detail Part. The primary reason for the winterization hatch is to transfer hot air back into the engine room to increase the temperature and reduce risk of freezing and fuel gelling. This feature was commonly seen on Canadian RS2’s and RS3’s, but was used in North America as well. Puttman Locomotive Works is releasing Norfolk Southern SD80ACU with Cab Glass. 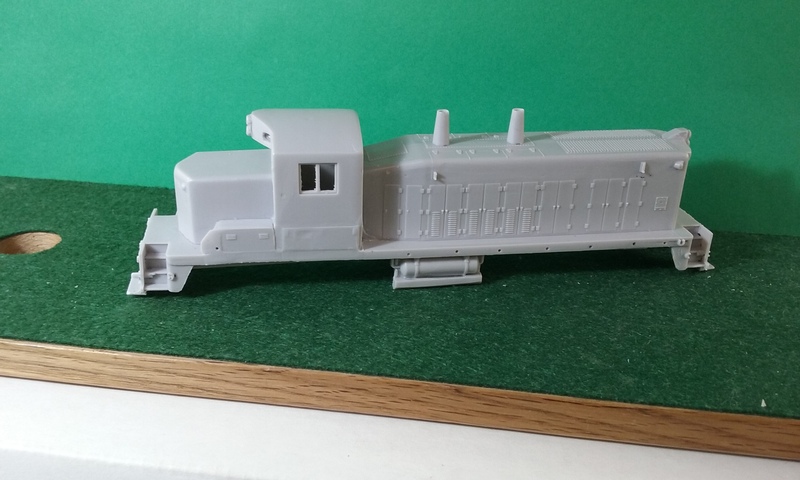 Puttman Locomotive Works is releasing the Delaware Hudson RS3u Chop Nose, also referred to an RS3m (depending on the source). 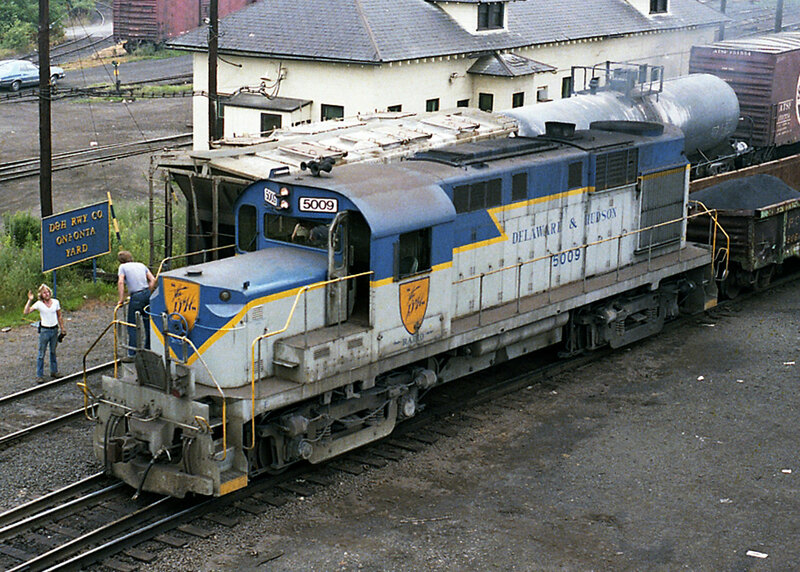 Delaware Hudson contracted Morrison-Knudsen to rebuild 8 of their aging RS3 locomotives with an upgraded Alco 251C engine. 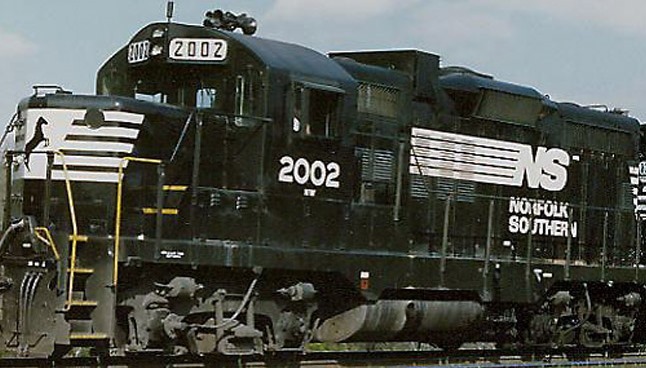 These new 2000hp locomotives sported a chopped short hood allowing better visibility. This required the dynamic breaks to be moved behind the cab. This locomotive shell will fit Atlas RS3 Master Series, Silver or Gold Series. Yellow box version can be used, Coupler box modification is necesssary. The Puttman Locomotive Works Product line will begin carrying the full HO Scale and O Scale line from Big Dawg Originals. 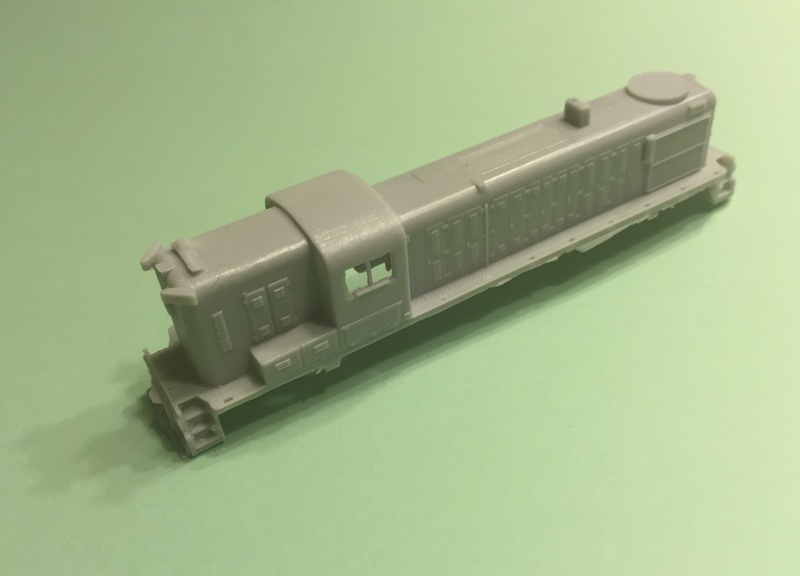 The CMR Products line of N Scale Shells and Detail parts will be combined into the Puttman Locomotive Works product line. The entire product line of shells and detail parts will be available on the CMRProducts.com Web Site along with eBay as of April 15, 2017. NetzlofDesign and Model works is releasing Norkfolk, Portsmouth and Belt Line Patch Out Set. 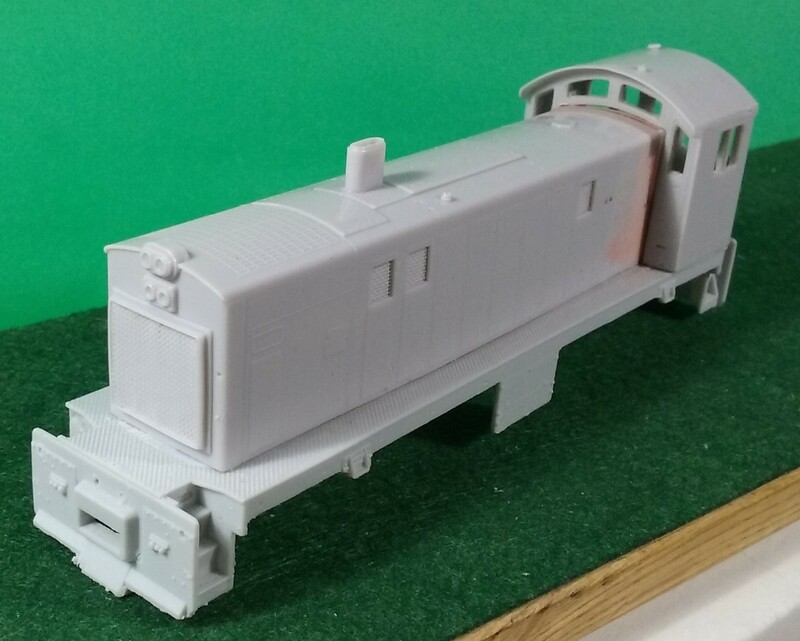 This supplementary set is designed to provide the modeler patch outs for NPBL #5259 and #5261. 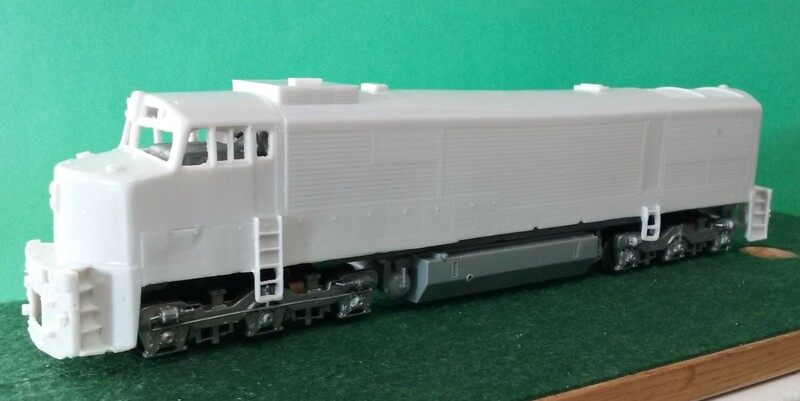 In addition, the modeler can combine this set with NetzlofDesign NPBL GP38-2 Set to produce #5259 and #5261 in the same scheme as #5260. This decal set provides Logos, Patch Outs and Numbers for #5259 and #5261. The set will be available in HO and N Scales. Other scales are available by special request. These decals can be purchased directly through the CMR Products Web site store. 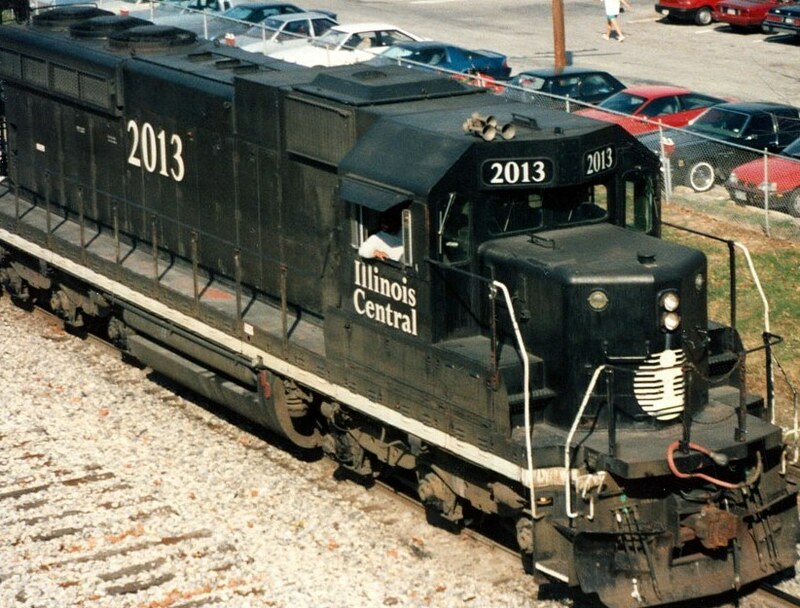 Norfolk Western sent 4 GP9’s to Illinois Central Gulf for rebuild. The resulting locomotives returned with chopped noses and paper air fitlers. 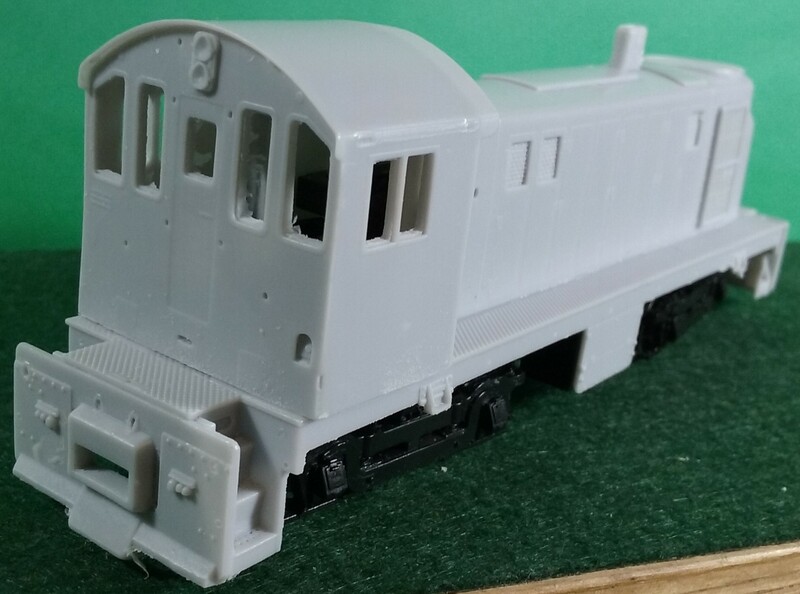 This kit will supply the modeler with the appropriate GP9 Chop nose and correct air fitler to be attached to the model. 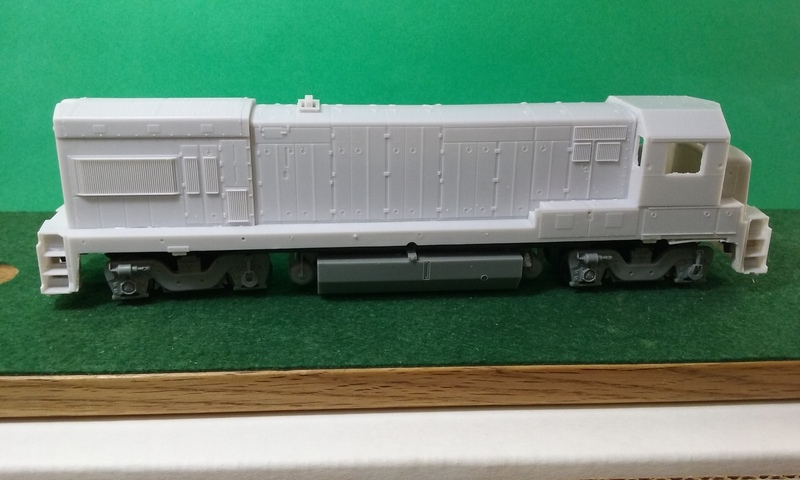 This model will work with locomotive numbers 5000-5003 (renumbered to 2000-2003). 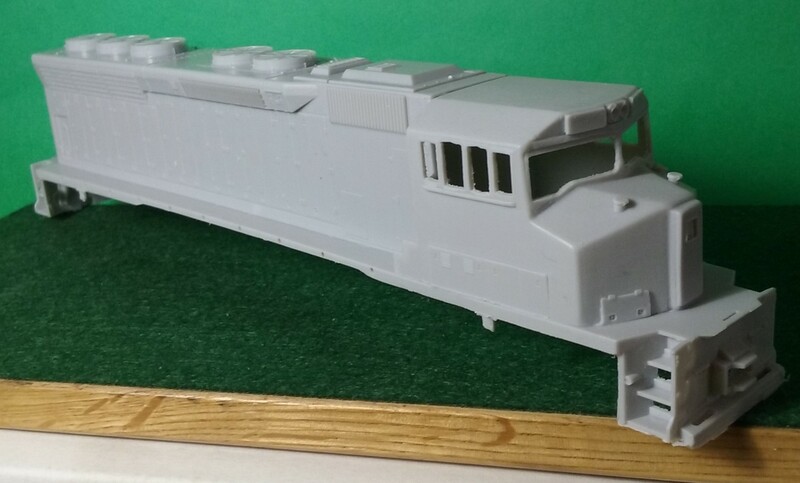 Innovative Modeling Products is releasing the N Scale SD70ACU Norfolk Southern rebuild Locomotive Shell. 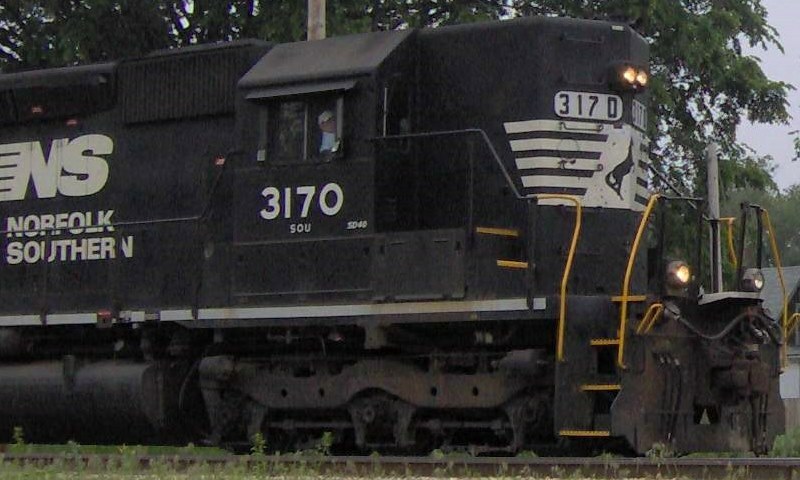 The SD70ACU is a SD90MAC rebuild completed by Norfolk Southern. Over 40, former Union Pacific SD90MAC’s have been rebuilt. 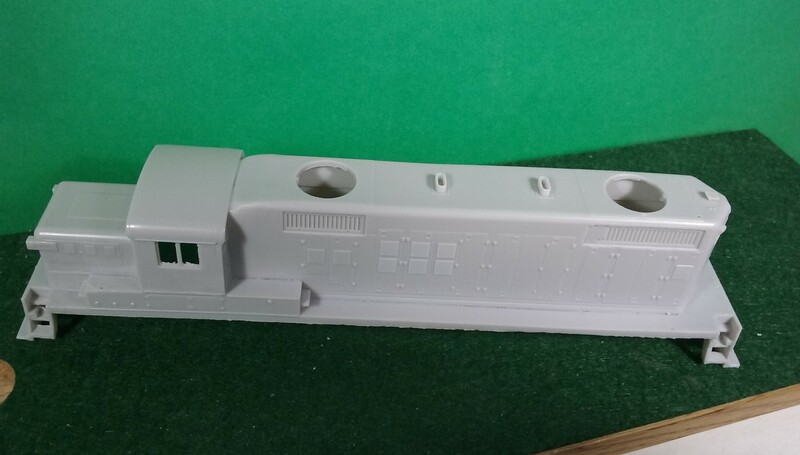 This locomotive shell will fit on Kato SD90/43MAC. Milwaukee Road rebuilt 54 of their GP9’s with EMD 645 Engines, chop noses and air filters. The resulting locomotive produced 2000 horsepower without a turbo charger. Milwaukee Road went through several iterations of the rebuild program from 1969 to 1973. This model kit will give the modeler a great starting point for rebuilds during the middle phase of the program. 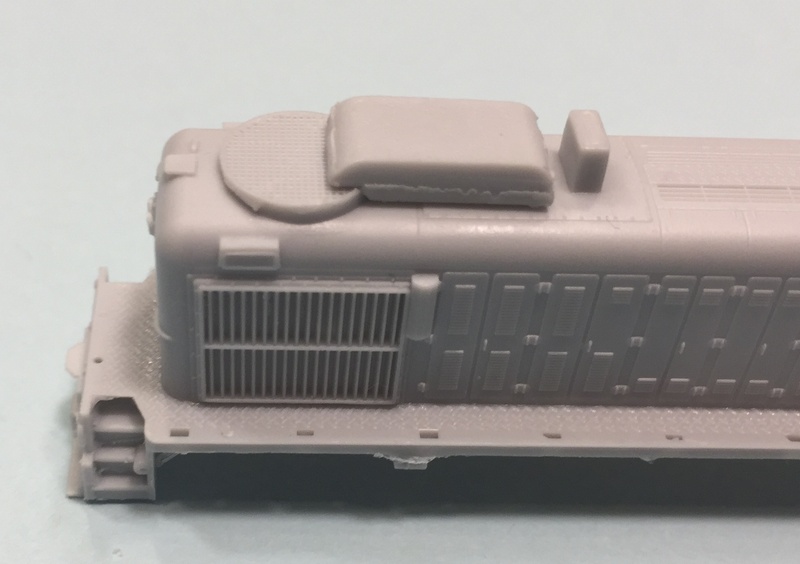 CMR Products is releasing an N Scale Shell Kit that will include a Chop Nose GP9 Non-Dynamic, Horst Air Filter Part and additional EMD Exhaust Stacks. 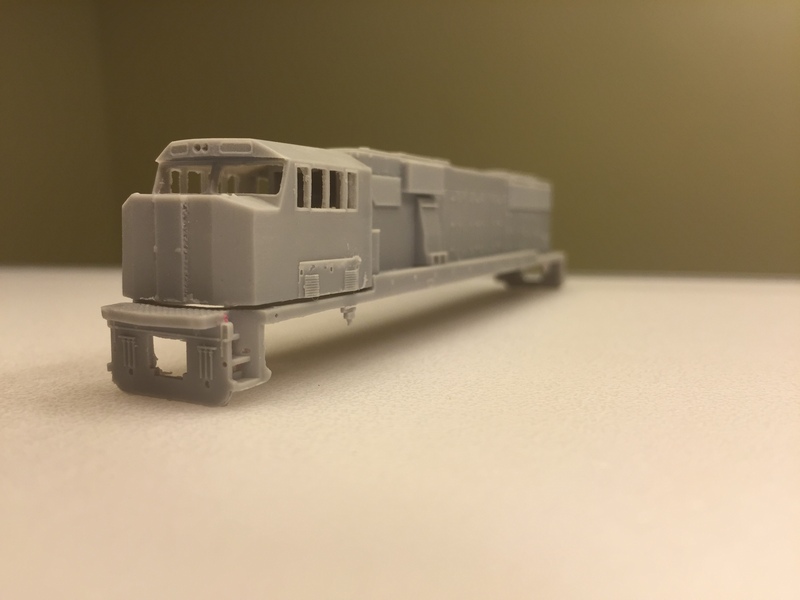 This kit will allow the modeler to assemble a Milwaukee Road GP20m Locomotive. 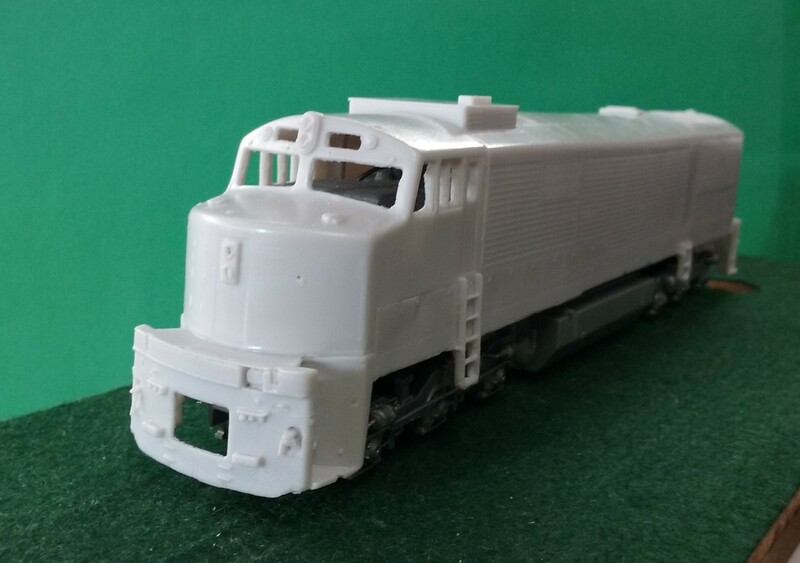 This Milwaukee Road GP20m shell would be compatible with MILW Numbers 956-963, 972-974, 976, 977, 979-981 (Phase 2A). During Conrail’s Early years, reliable motive power was in short supply. In an effort to tackle this issue, Conrail sent 9 GP7s to Illinois Central Gulf RR’s Paducah, KY shop to rebuild the locomotives. ICG chopped the short noses for better viability, changed the control stands for short hood operation, and overhauled the locomotive prime movers. Additionally Dynacell Air Filters were added to the locomotives. This Conrail GP8 Chop nose nonDynamic shell would be compatible with Conrail Numbers 5402, 5403 and 5405. Also effective for Nittany and Bald Eagle #1602. 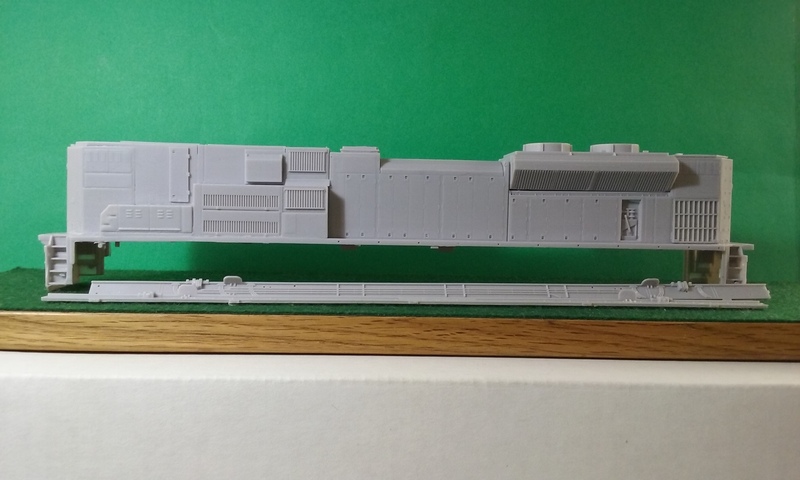 The Conrail GP8 Chop Nose Non-Dynamic Locomotive shell that will fit on an Atlas GP7 or GP9. 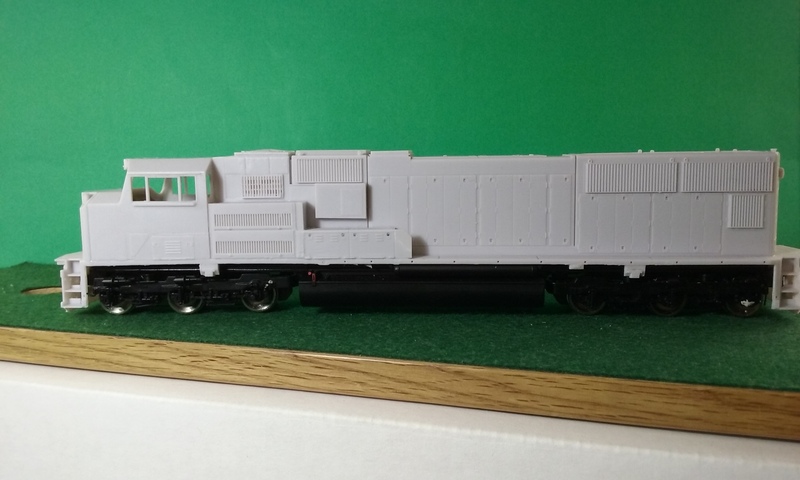 CMR also offers other N Scale EMD GP7/9 rebuilds. These are available on CMRProducts.com. The St. Louis–San Francisco Railway sent 5 of their aging Alco RS2’s to EMD for rebuild in late 1959 and early 1960. These locomotives were rebuilt similar to other EMD RS rebuilds where the long hood was replaced with a GP9 long hood. In this case, the RS2’s received a GP9 Phase 3 Long hood (replaced 2 36″ domed fans with a single 48″ domed fan). Frisco’s RS2M’s were returned and numbered 550-554. 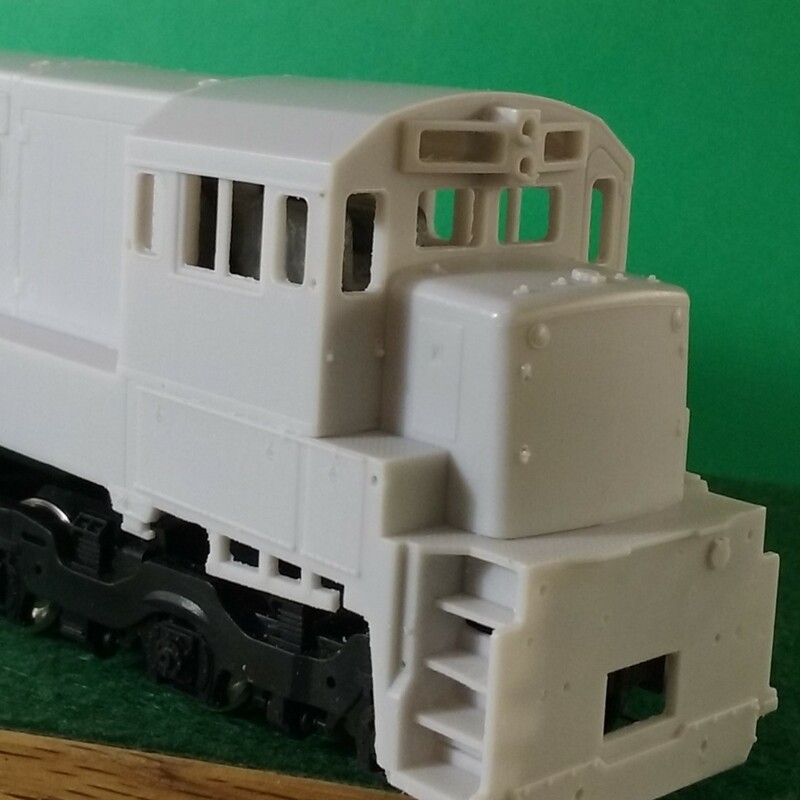 CMR Products offers the Frisco RS2M Locomotive shell that will fit on an Atlas RS3. CMR also offers other N Scale Alco rebuilds including MKT RS3M, Rock Island RS2M and Rock Island RS3m. HO Variants are also available through Big Dawg Originals and on our site. During Conrail’s Early years, reliable motive power was in short supply. In an effort to tackle this issue, Conrail sent 9 GP7s and 16 GP9s to Illinois Central Gulf RR’s Paducah, KY shop to rebuild the locomotives. ICG chopped the short noses for better viability, changed the control stands for short hood operation, and overhauled the locomotive prime movers. Additionally Dynacell Air Filters were added to the locomotives. While later rebuilds did not have the chop noses, these early models can provide some diversity to your Conrail roster. You can find variants with and without dynamic breaks. 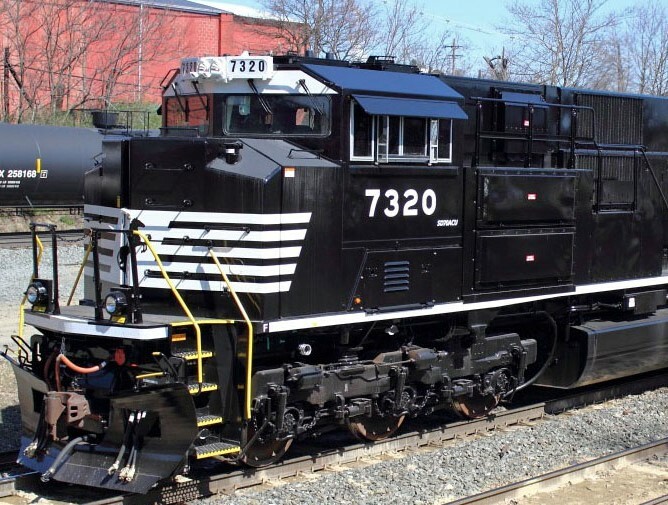 CMR Products offers chop nose variants in both the GP7 and GP9… both with and without dynamic breaks. 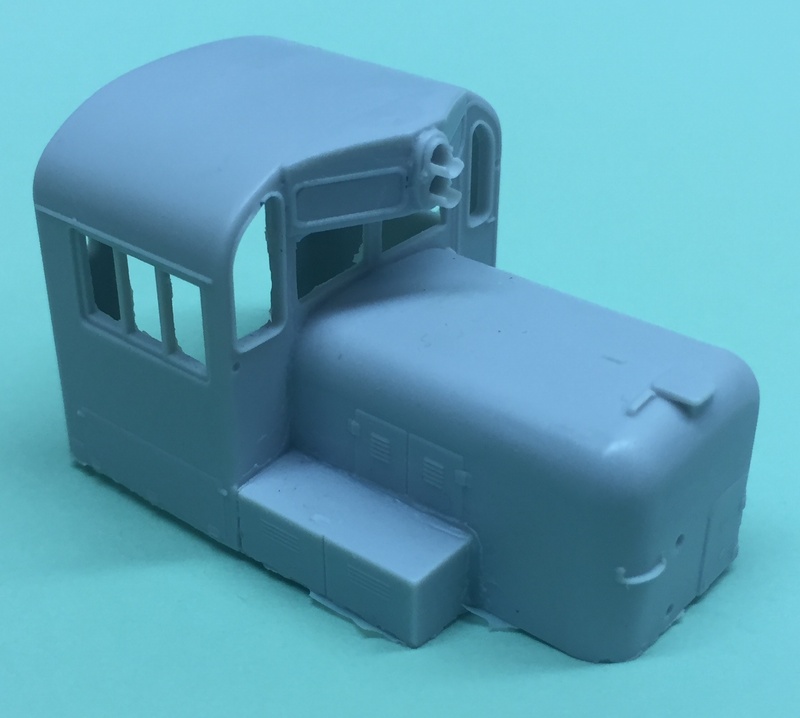 To finish up your model, grab Innovative Modeling Products “Dynacell Air Filters” that can be glued to the side of the cab for that finishing touch. 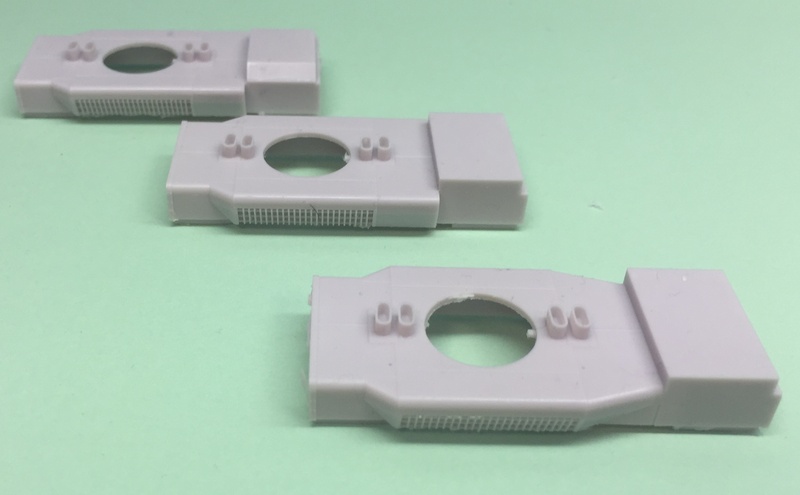 Innovative Modeling Products “EMD Exhaust Stacks” can be added if you need a couple extra exhaust stacks (depending on the prototype). 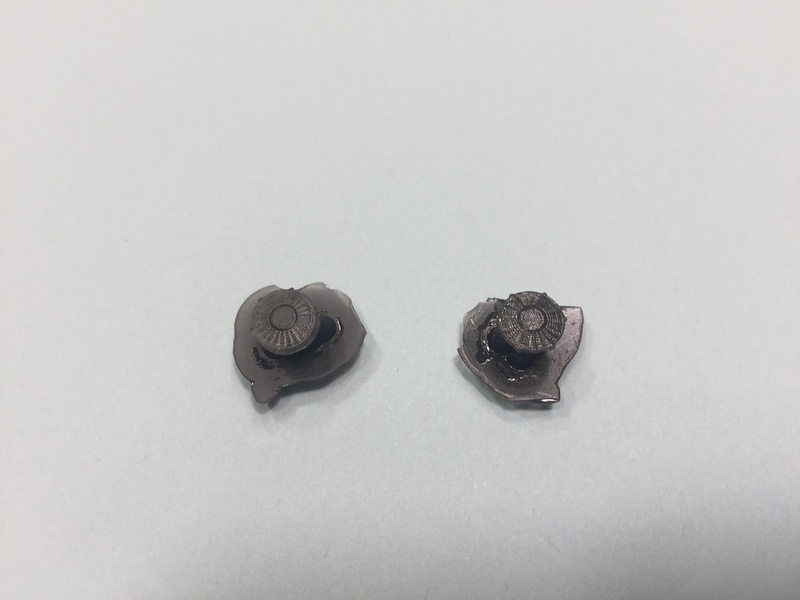 Over the weekend it came to my attention that we haven’t advertised the numerous shells we offer. 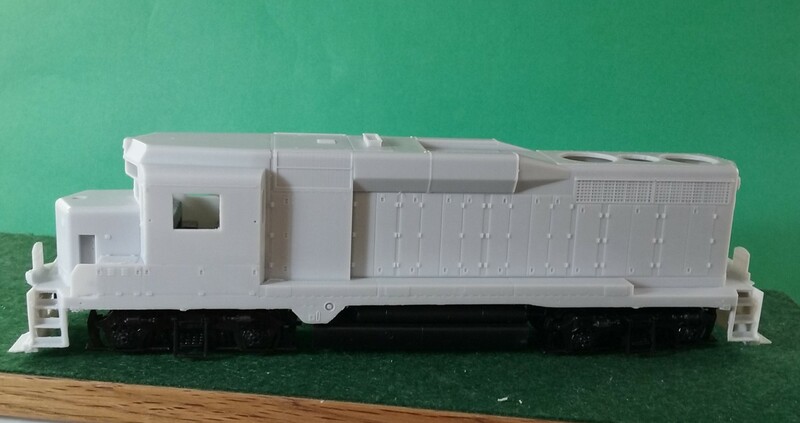 We will be taking some time to go through our various offerings and sharing what information we can find about the prototype locomotives. 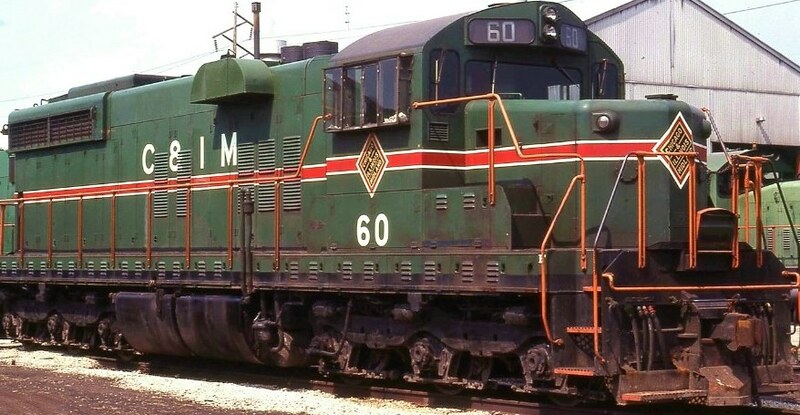 Our first locomotive we will be discussing is the EMD GP30 B unit. 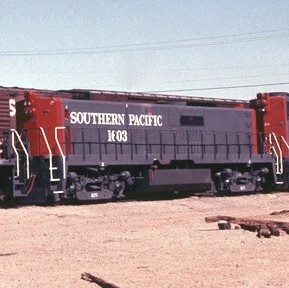 Union Pacific was the only owner of the GP30B unit. They purchased 40 in total, numbered 700B-726B (freight service) and 727B-739B (passenger service). The passenger service locomotives were equipped with steam generators. A 1200 gallon water tank was located inside the car body adjacent to the generator. 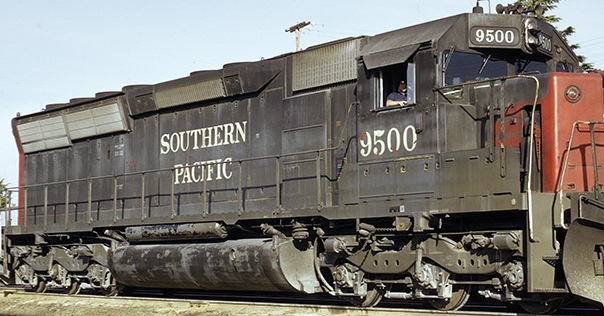 The passenger GP30Bs were used with the SDP35s on Vietnam-era troop trains between Fort Riley, KS and the west coast. They were also used regularly on secondary passenger trains. Sometime in the 1970s, all the GP30Bs were placed in freight service and the steam generators were retired inside the locomotives. While some GP30b’s were retired due to wrecks, by September 1981, all Union Pacific remaining GP30b’s (28 in total) were in storage. In August 1983, the GP30b’s were transferred to Salt Lake City to have their prime movers removed and used to repair a number of GP30’s. The B units were retired September through November 1983. Most were sent to the scrappers in 1986. 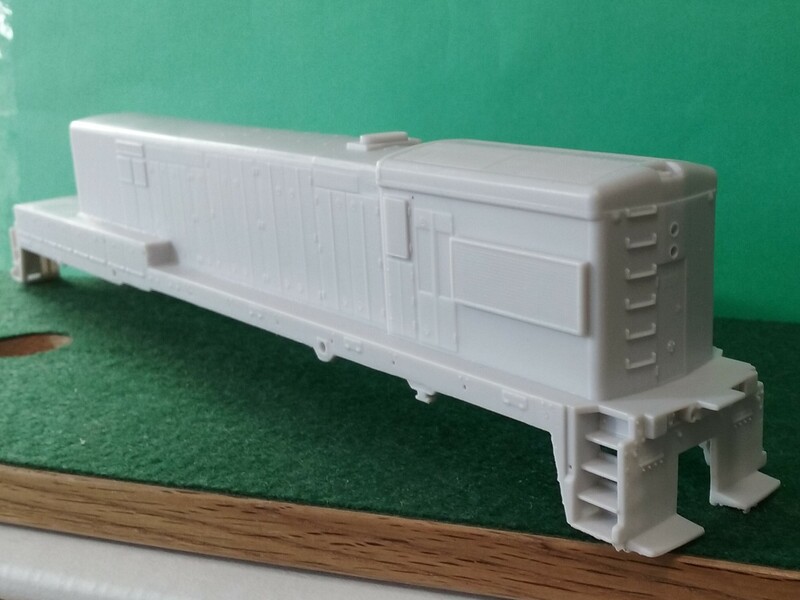 CMR Products has updated it’s N Scale SD60E Locomotive shell. Based on our customer’s feedback, there were a number of enhancements that were made to the locomotive. The two key changes include fixing the Cab position making it part of the shell, and changing one of the primary fans on the top of the locomotive. 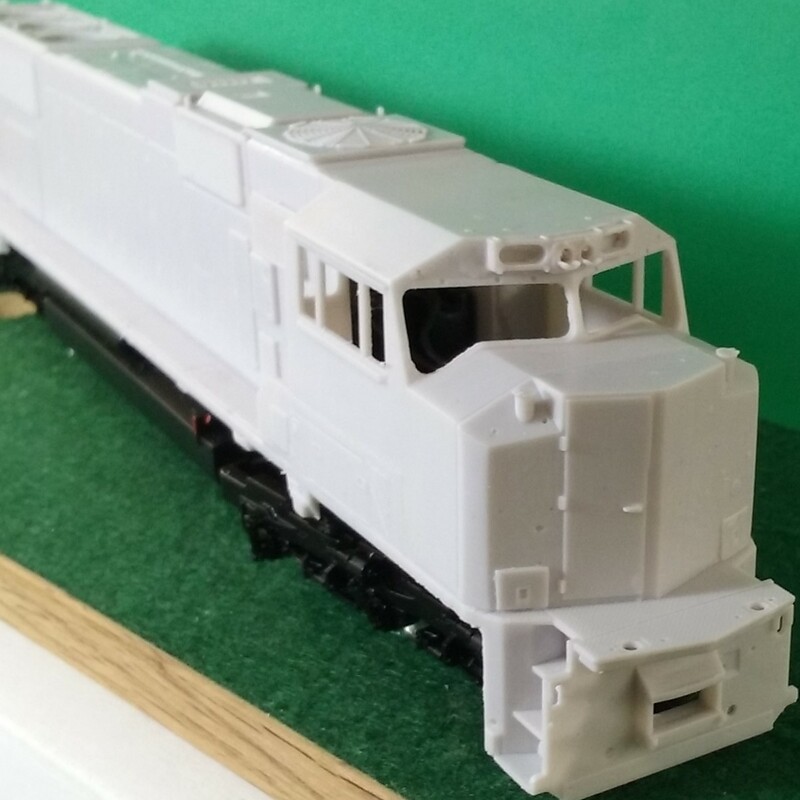 All SD60E shells will be of the updated version. CMR Products is announcing the release of the N Scale RS-3 Hammer head shell. Alco created the Hammer Head model to house both the dynamic break grid and the steam generator. This unique model was only purchased by two railroads. The WM had four of these, #192, #193, #194 and #197. The PRR had one, #8445, sold to LV for its #211. The “Beep” (also referred to as the SWBLW) is an individual switcher locomotive built in 1970 by the Atchison, Topeka and Santa Fe Railway at its Cleburne, Texas, workshops. Originally built as a VO1000, ATSF was hoping to follow their highly successful CF7 program, with a rebuild program of their aging non-EMD switcher fleet. 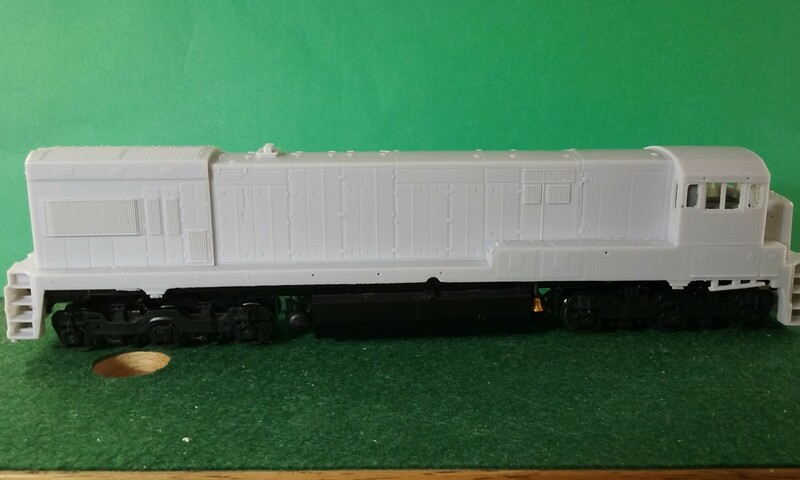 The goal was to fit them with new EMD prime movers, and rebuild the long hoods of the switchers. This proved to be too costly of a rebuild program, thus only 1 SWBLW was built. 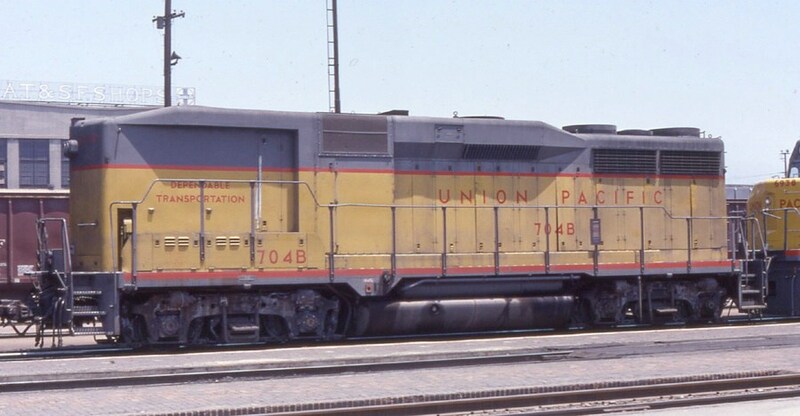 This switcher served ATSF from 1970 as #2450, later being renumbered to #1160 in 1974, and renumbered again in 1977 to #1460. The unit lasted into the BNSF merger where it retained the #1460. The locomotive had 35 years of active service, making it the longest-lived ATSF rebuild on their railroad. 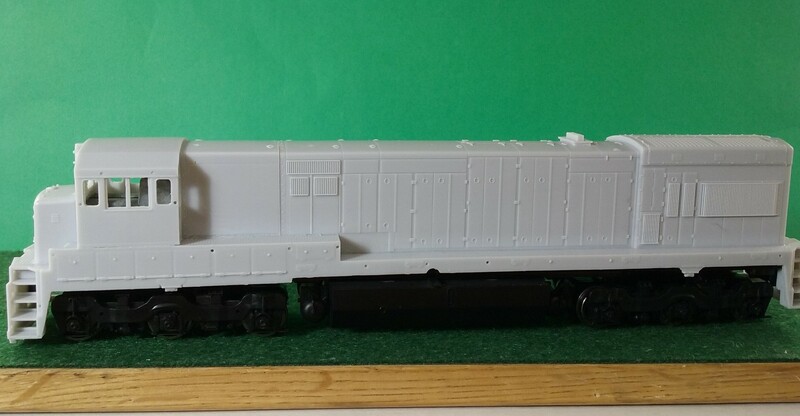 This locomotive is available on our website and is selling at $25.00. CMR Products has released the EMD GP35 High Hood variant. EMD produced over 1200 GP35s over the 2.5 year production run (July 1963-January 1966). 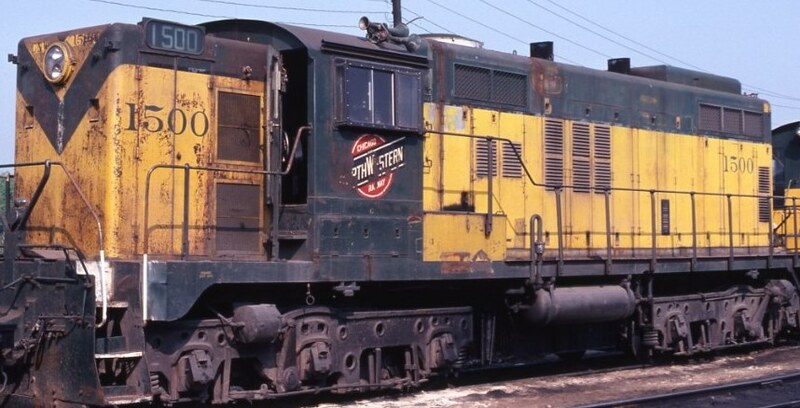 The High Hood variant was purchased by Norfolk Western and Southern Railway, these workhorses have seen years of service and have been resold to a number of shortlines. 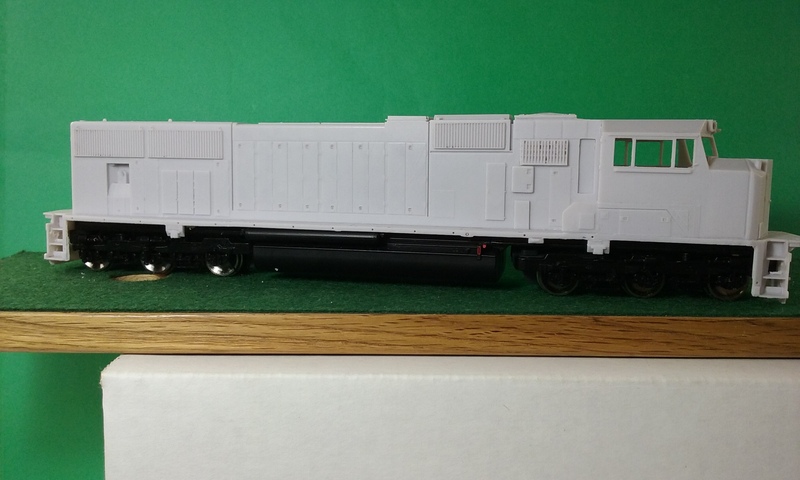 CMR Products has released the EMD SD40 High Hood variant. Originally owned by Norfolk Western and Southern, these workhorses have seen years of service. 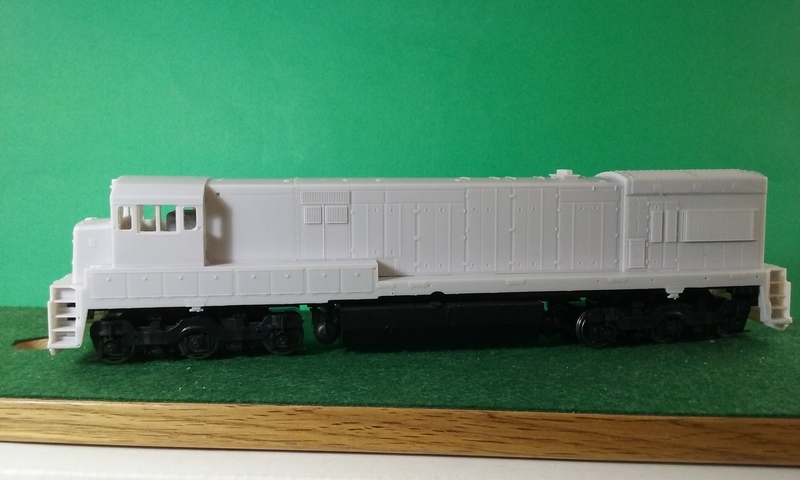 This locomotive is available on our website and is selling at $25.00. More engine shells will be announced soon! New N Scale Shells Announcement! Just released by CMR Products is the new SD60E shell. 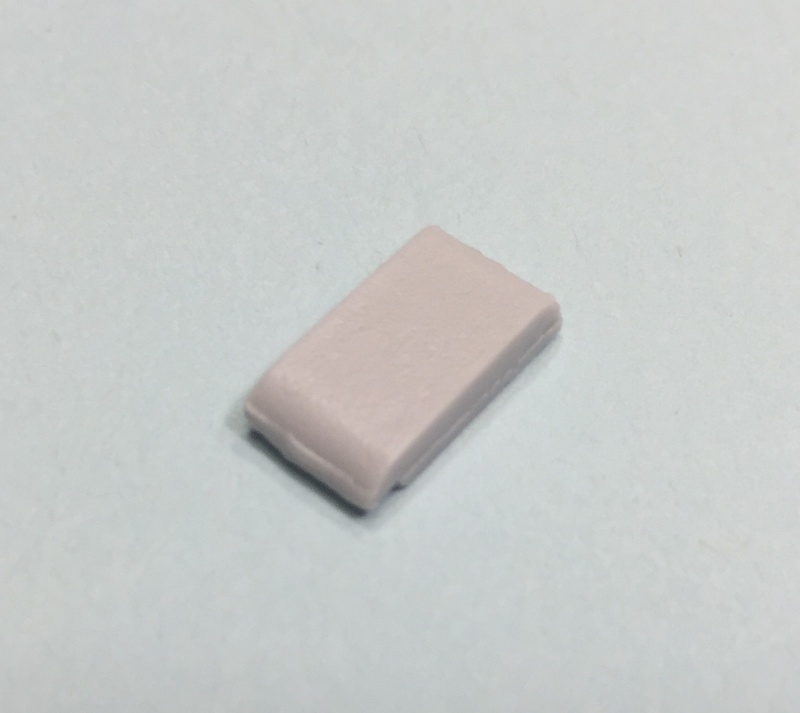 Very popular in HO Scale, CMR Products has produced the same high-quality engine shell in N Scale. Also released, is the RS3M Rock Island (GP9 Phase 3) and RS2M Rock Island shell in N Scale as well. All three are selling at $25.00 a piece. More engine shells will be announced soon! Keep it here. 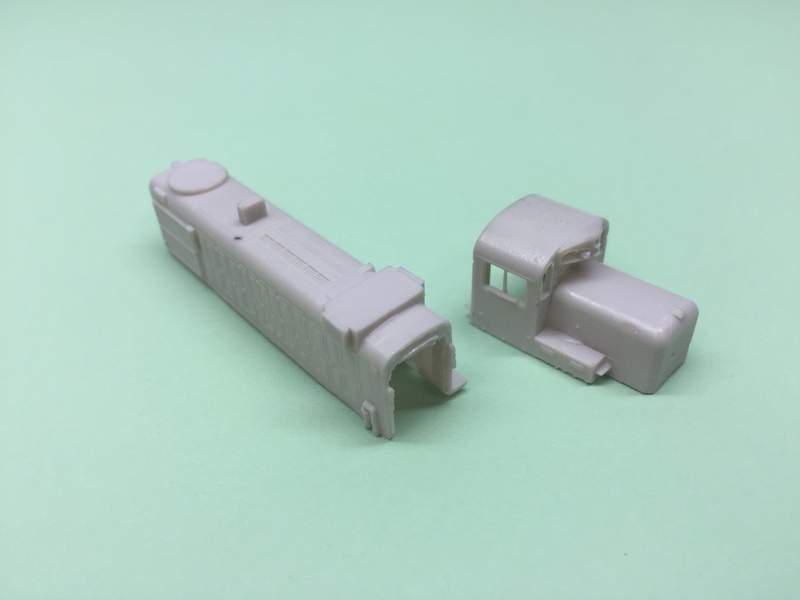 CMR Products has been working closely with Big Dawg Originals over the last 9 months to offer quality custom HO and N Scale shells, cabs and detail parts. CMR Products has reached an agreement with Big Dawg Originals to acquire the N Scale product line from BDO effective January 1, 2016. We are very excited and looking forward to enhancing and growing this product line along with offering the same great product at the same great prices. 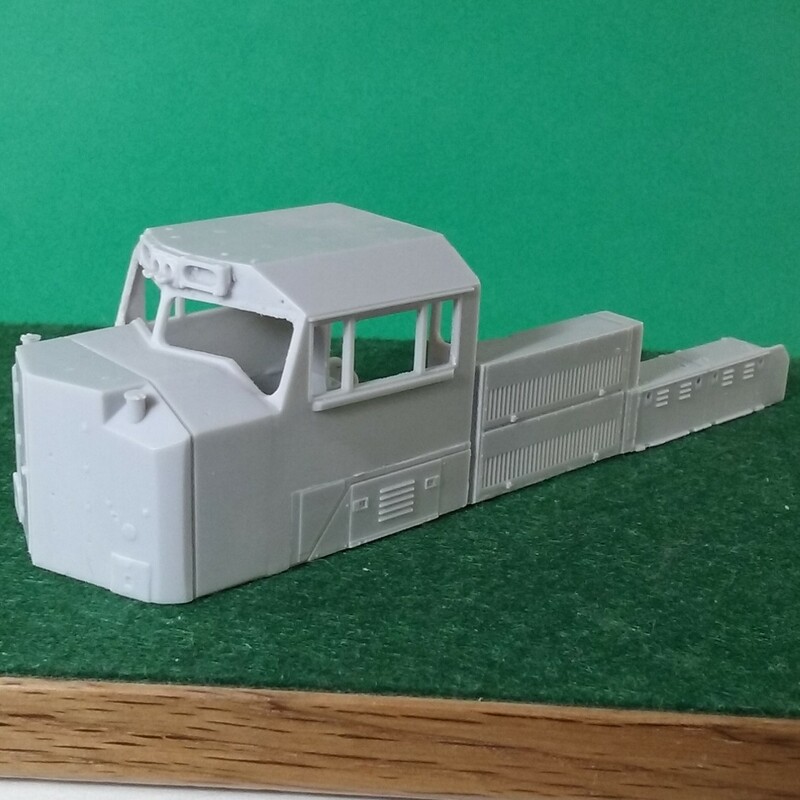 Big Dawg Originals will now be able to focus on enhancing and growing its high quality custom HO Scale products. Further, CMR Products will continue to offer Big Dawg Originals products through our web site and eBay. 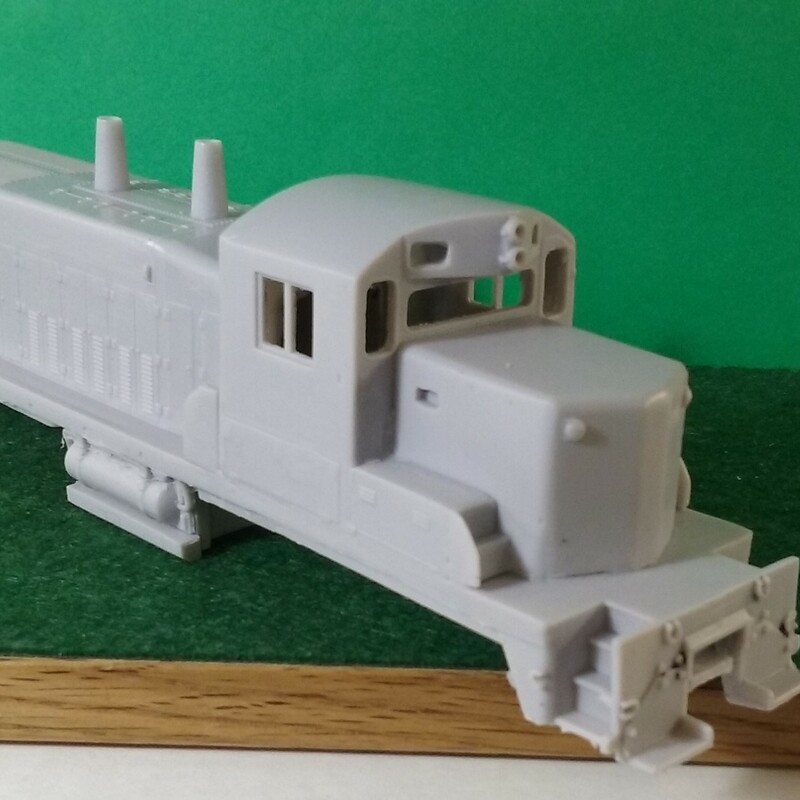 Starting January 1st, CMR Products will be offering the entire Puttman Locomotive Works N Scale line on our web site and featuring specific shells on eBay. 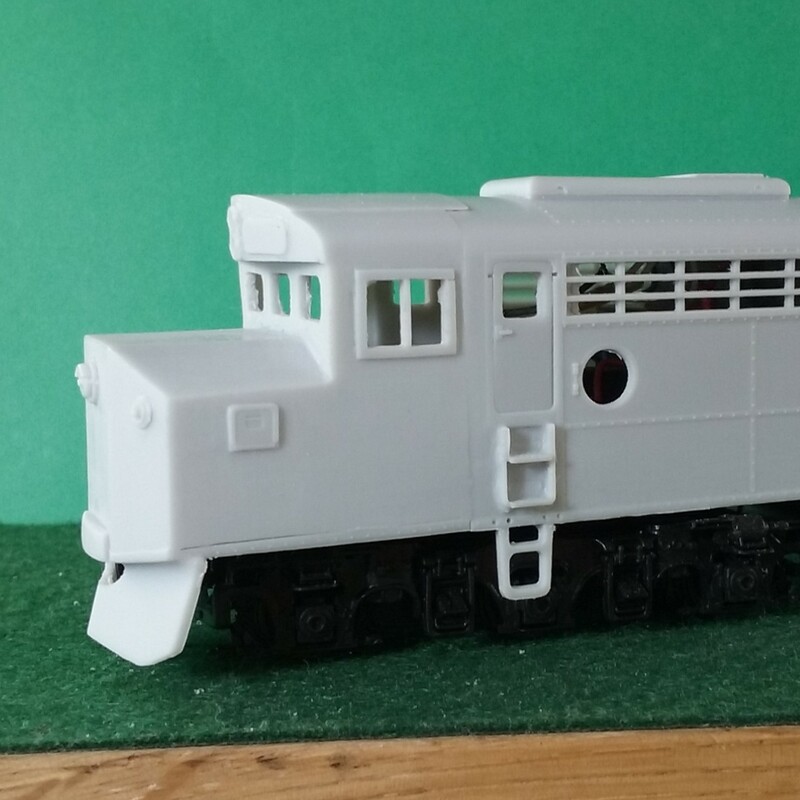 CMR Products is now offering two new models the HO C30-7a and C36-7 locomotive shells produced by Big Dawg Originals. These shells will fit on Atlas C30-7 frames. These are undecorated polyurethane shells. No additional detail parts are included in the purchase. We are expecting our first shipment of these shells in July. Pre-Order yours today! Also keep in mind our custom painting service that we offer. 50 of these units were originally built for Conrail (6550-6559). Both the C30-7 and C30-7a were 3000 horsepower, but the C30-7a did this with a 12-cylinder engine instead of the normal 16-cylinder engine. This provided Conrail the same horsepower but at a fuel savings. You can tell the difference by the number of High Doors, C30-7a had only 6 while the C30-7 had 8 doors. Norfolk Southern (8083-8132) and CSX (7095-7115) inherited these engines after the Conrail purchase in 1999. 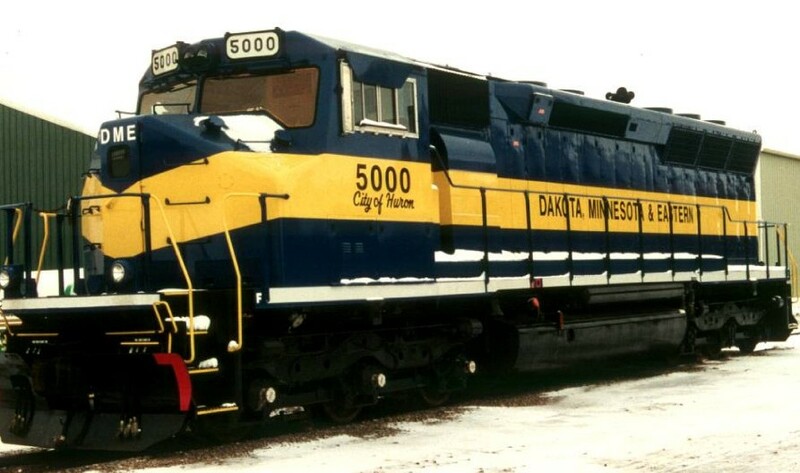 599 of these 3600 horsepower GE locomotives were produced over their 12 year production run (1978-1989). The majority of these units (422) were shipped to China Railways. In the United States, a number of Class 1 Railroads purchased this locomotive including Conrail – 25 (6620-6644), Missouri Pacific – 60 (9000-9059), Norfolk Western – 31 (8550-8530) and Norfolk Southern – 12 (8531-8542). Other railroads to use these units included Union Pacific (former MP engines) and CSX (former Conrail) through mergers or purchases. CMRProducts.com is proud to announce the release of new products from Big Dawg Originals. Norfolk Southern SD60e, MK5000c (Phase 1) or MK50-3, Baltimore & Ohio SD20-2 (also owned by CSX), and the Western Maryland GP9m Cab. All of these HO Shells/Cabs can be special ordered. We have the SD60E and SD20-2 available in stock and in our store. Additional N Scale products coming soon!